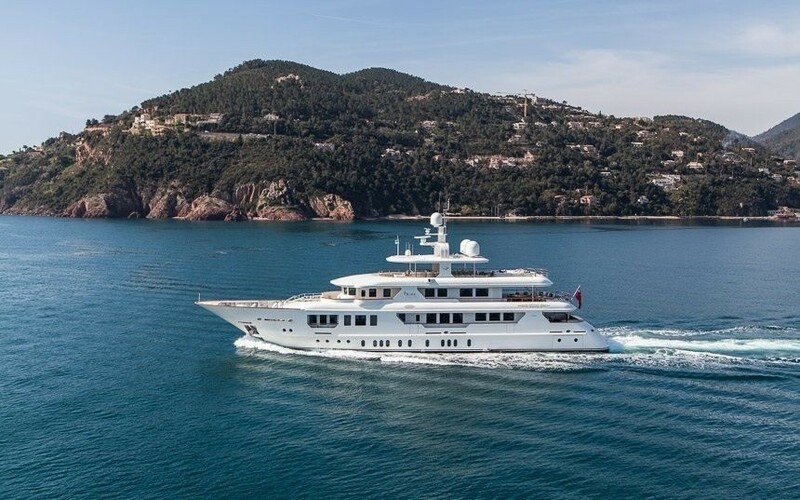 The beautiful 45-metre superyacht PRIDE is a lovely Viudes 45 vessel that was finished and launched by the prestigious Italian shipyard Mondo Marine in 2013. 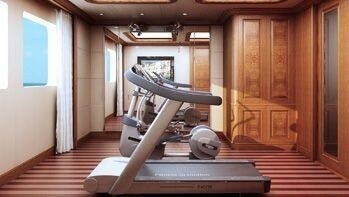 Her construction was fully executed by the Viudes Team. 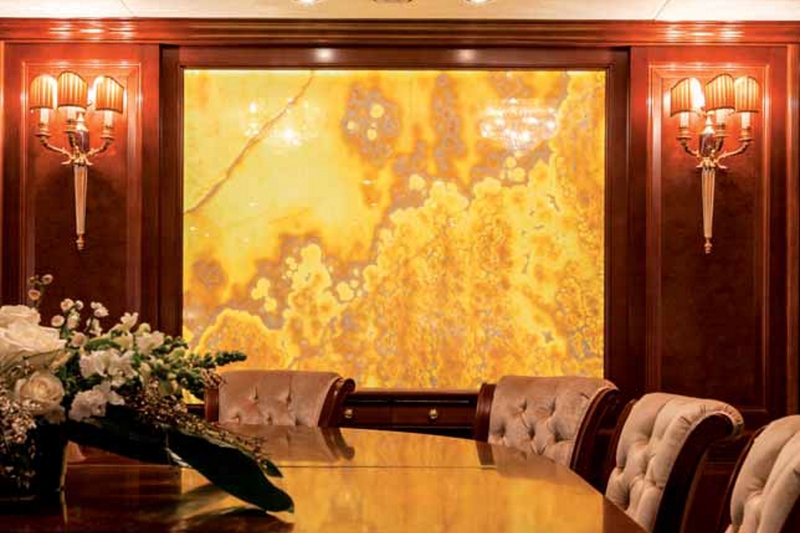 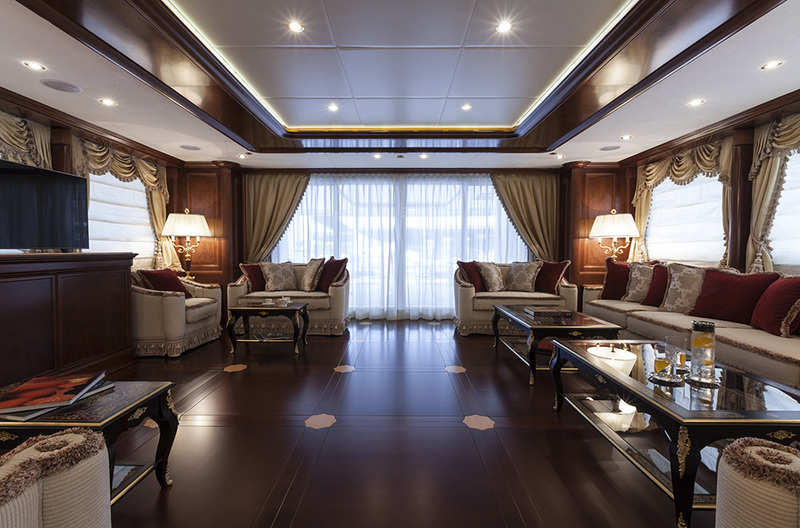 Her classic interior design is by the yard's in-house team. 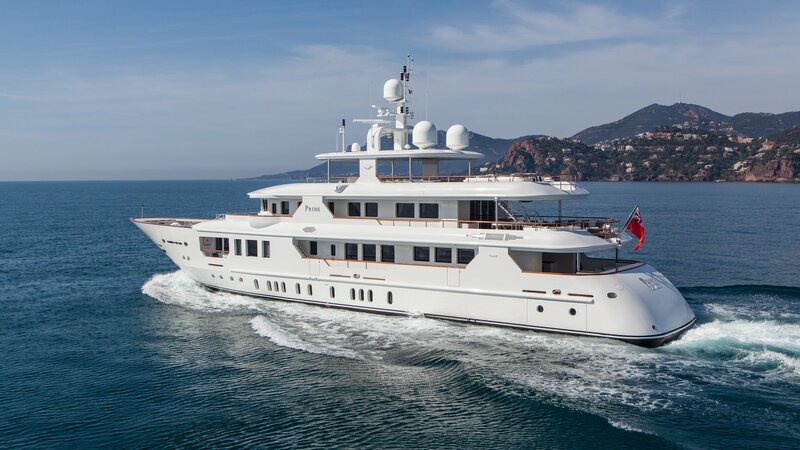 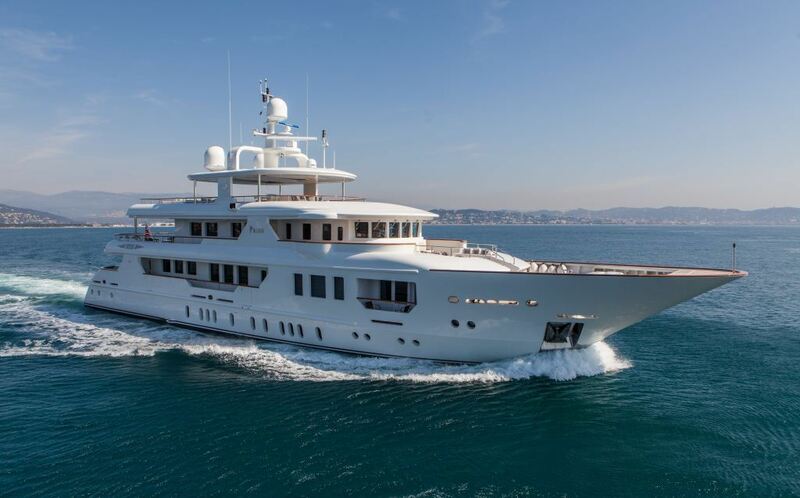 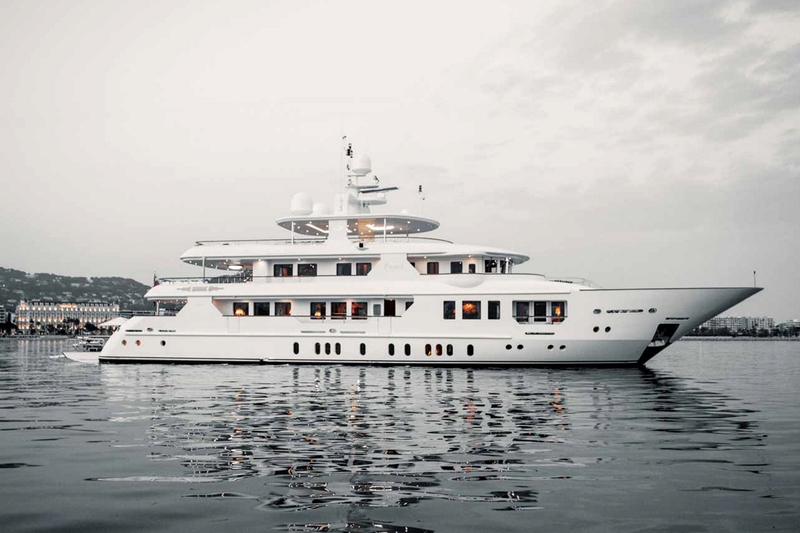 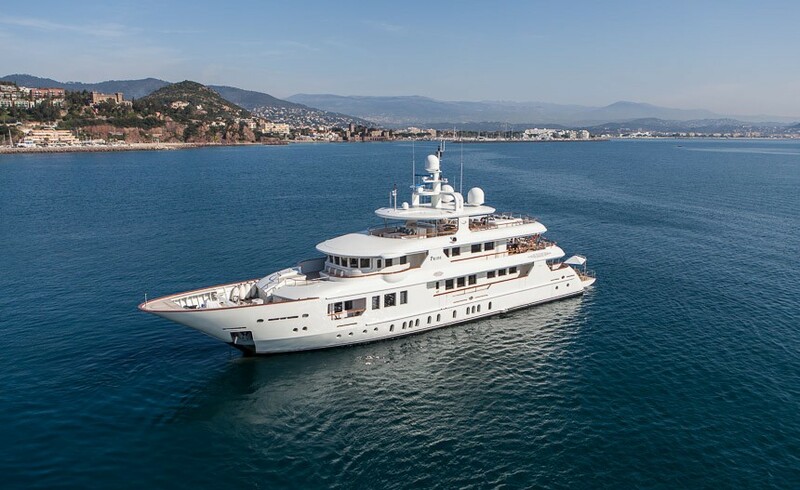 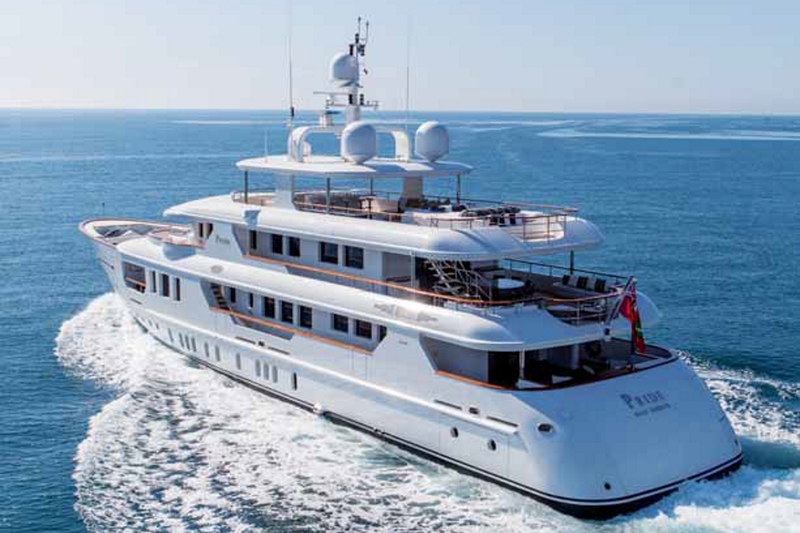 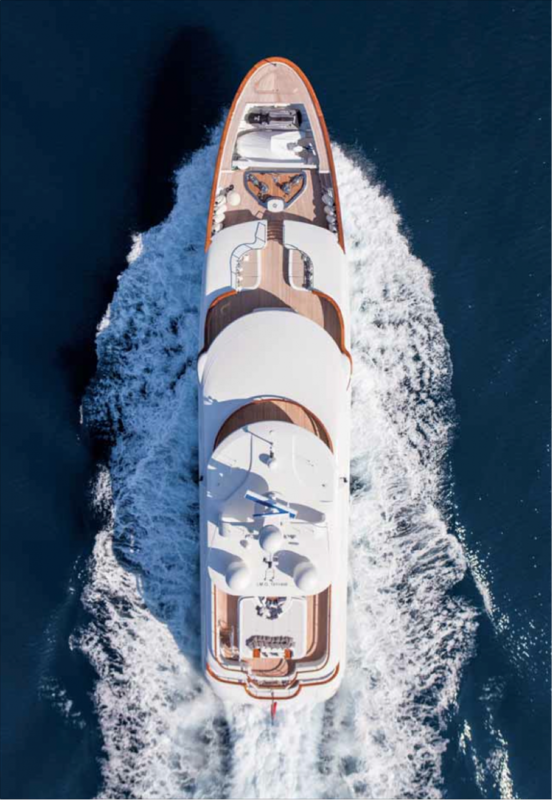 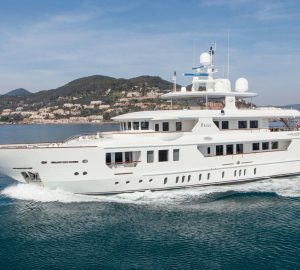 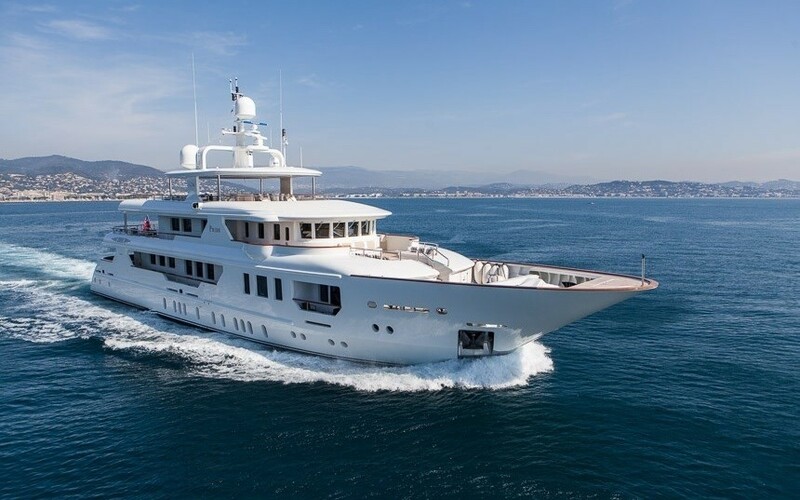 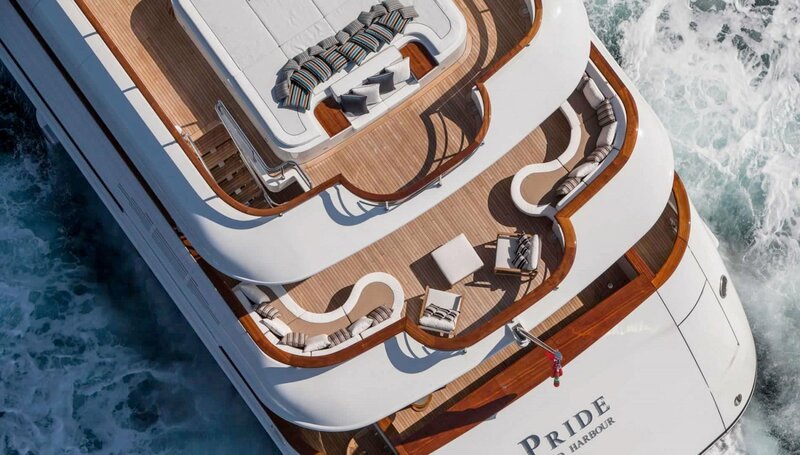 In addition to her exceptionally large exterior spaces, including huge sundeck and beach club, the 45m luxury yacht PRIDE boasts elegant and comfortable accommodation for up to 12 guests in 6 cabins. 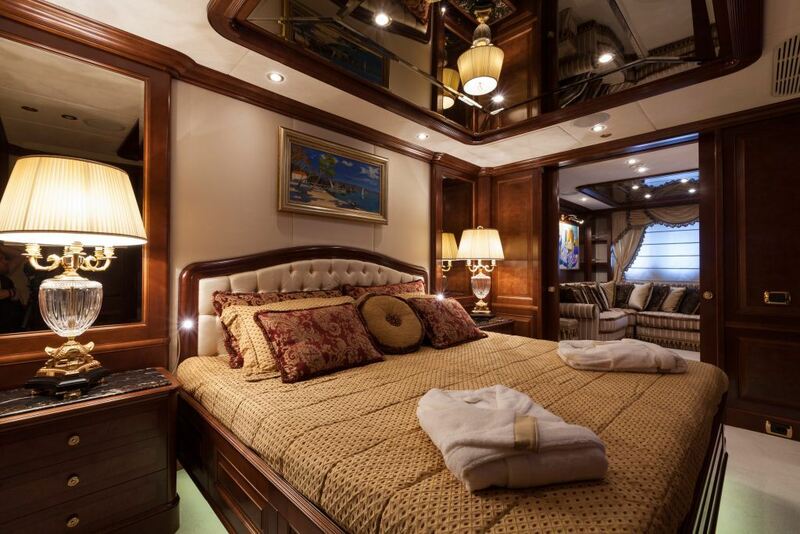 There is a full-beam master suite with two side balconies, a full-beam VIP cabin, two double cabins, as well as two twin cabins. 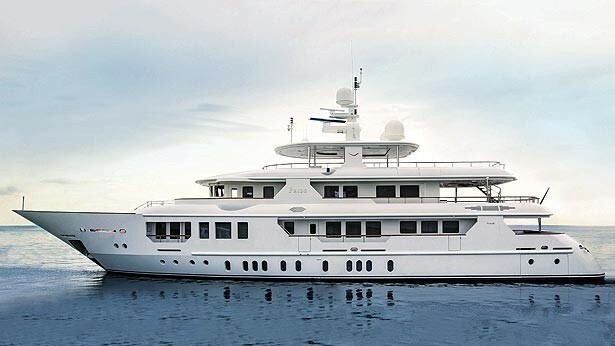 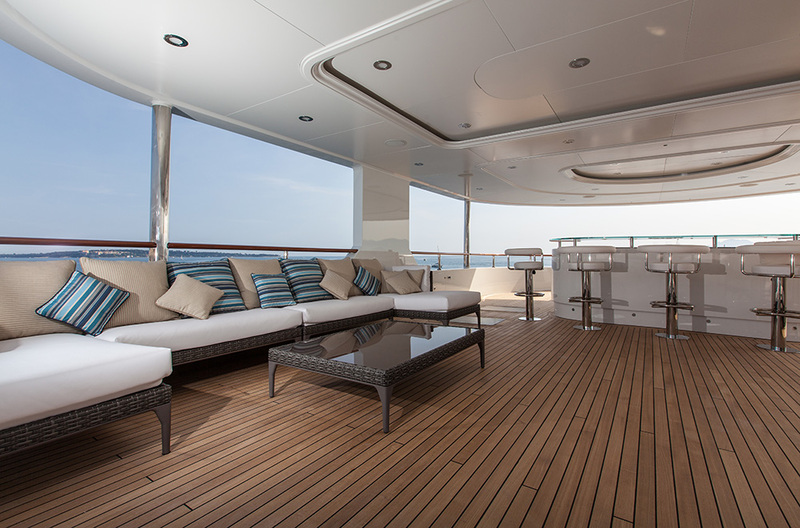 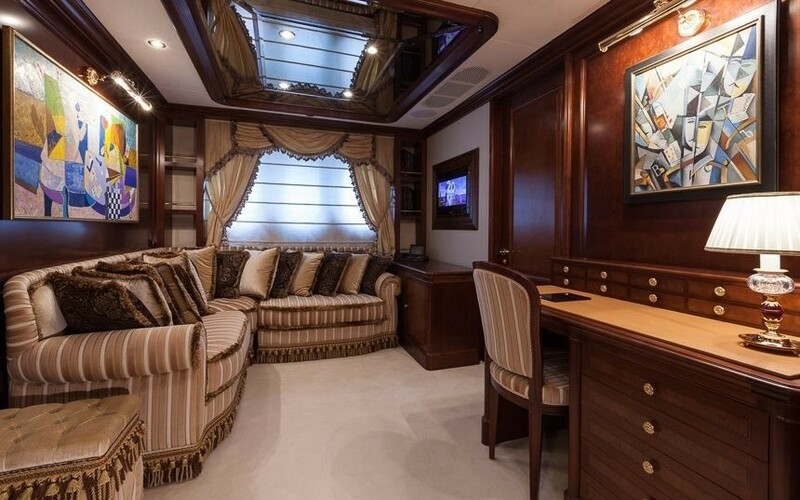 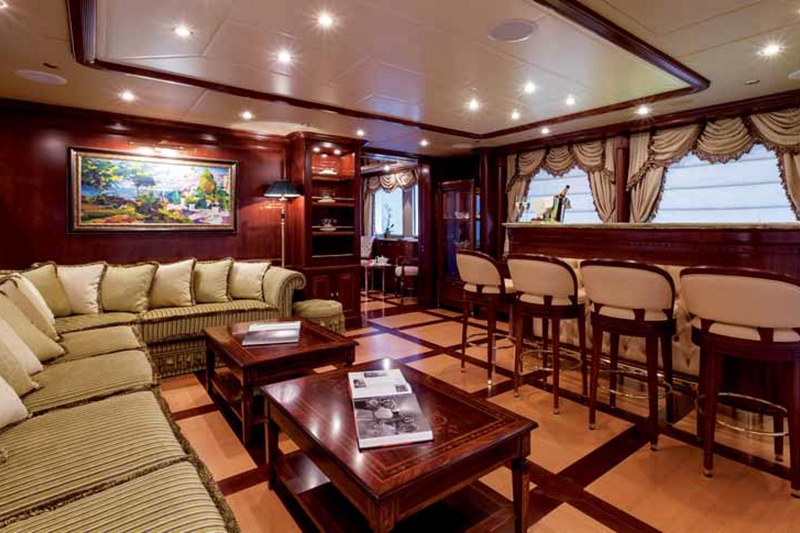 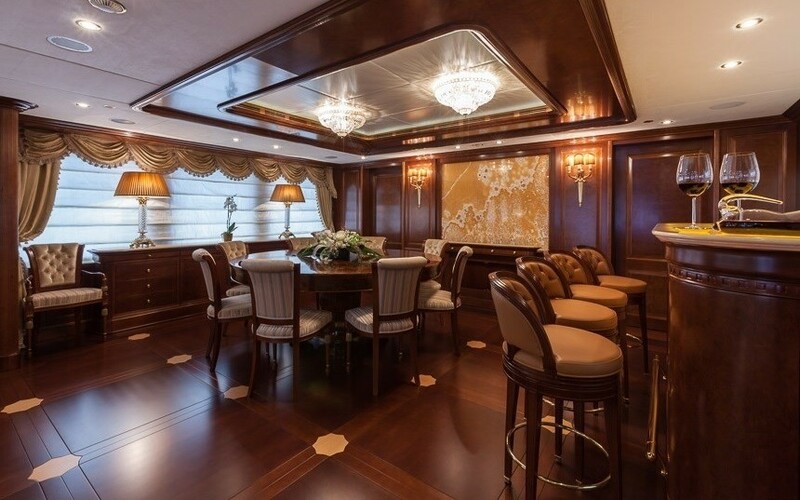 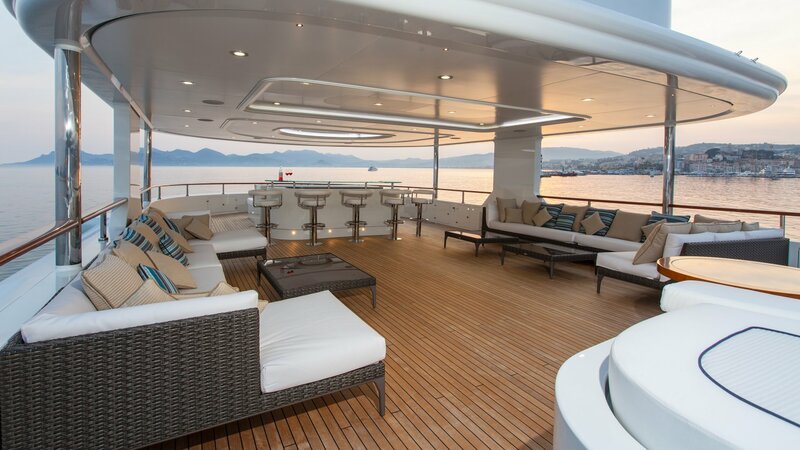 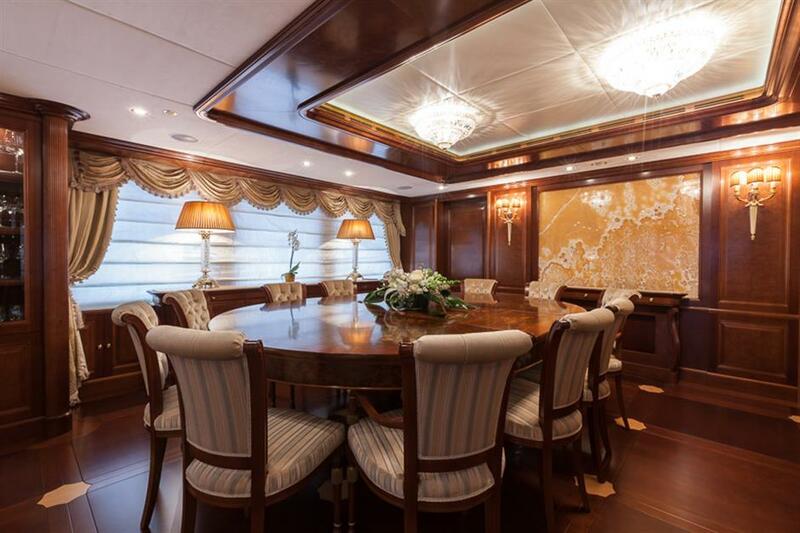 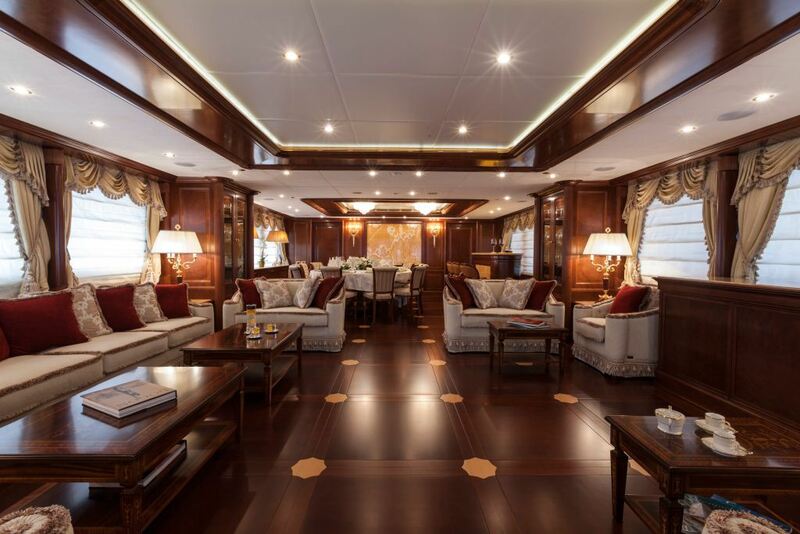 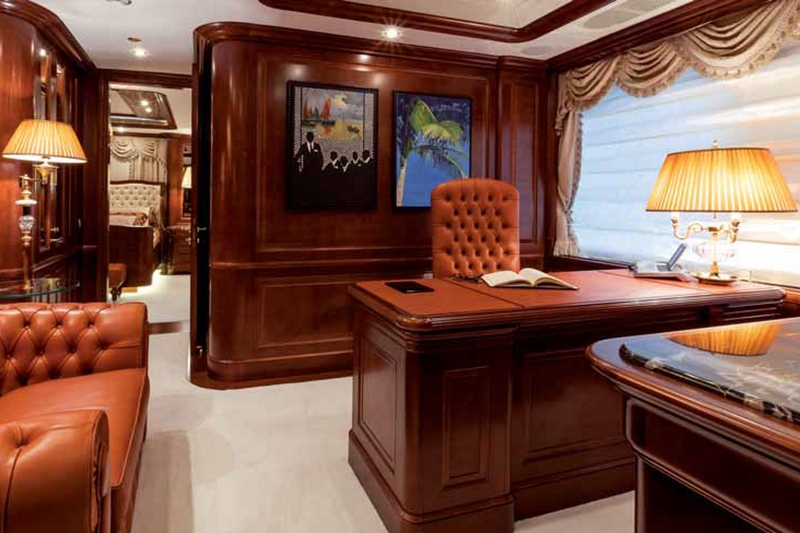 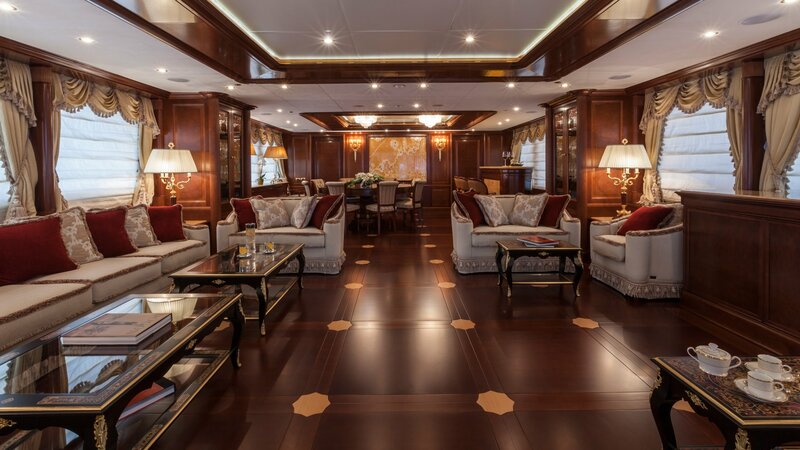 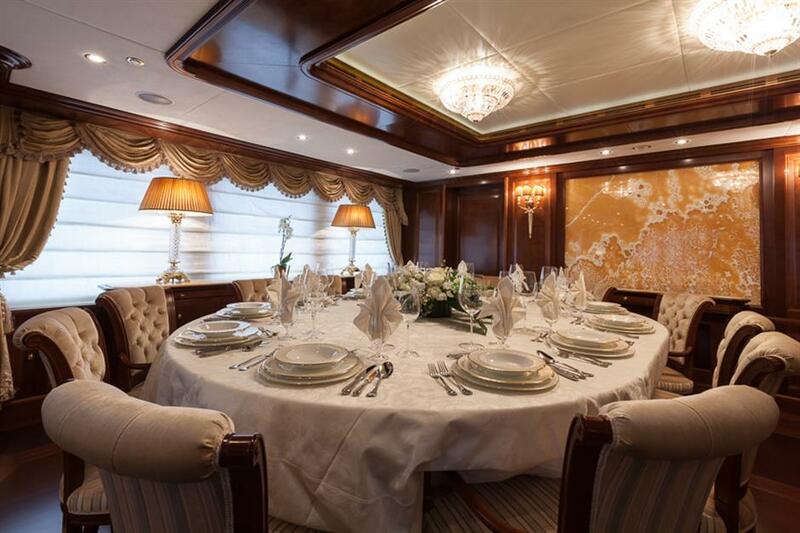 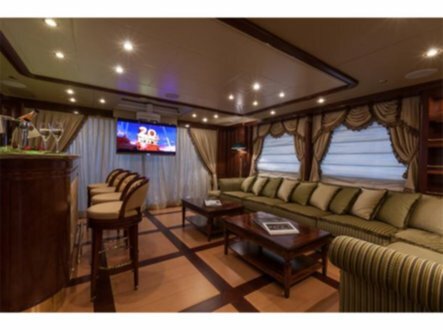 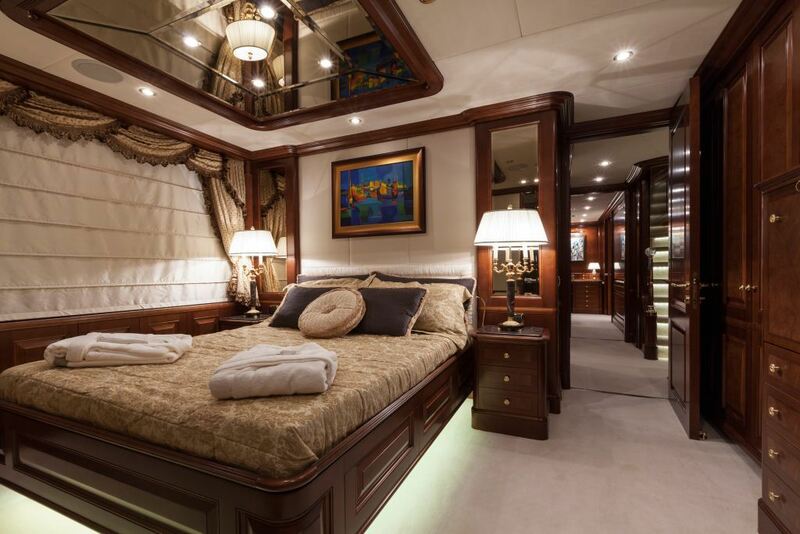 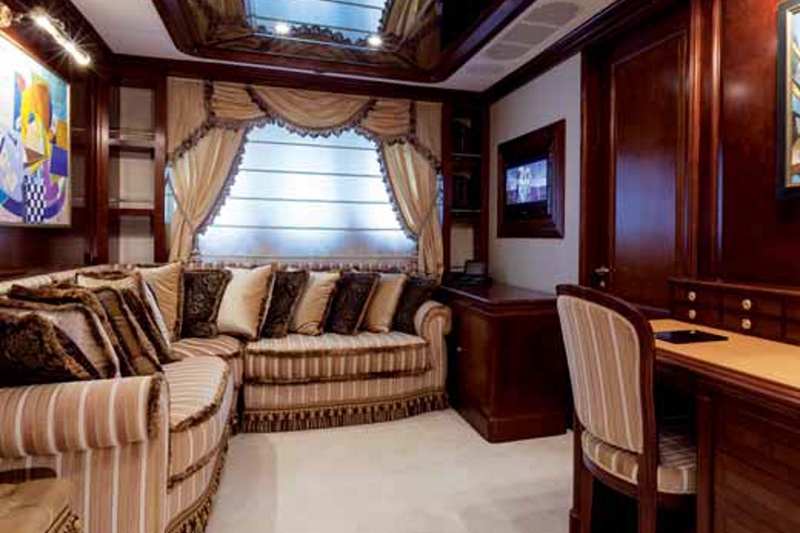 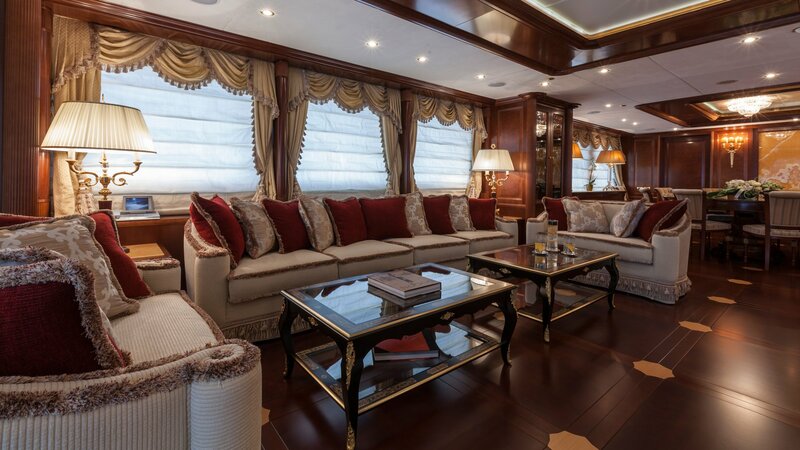 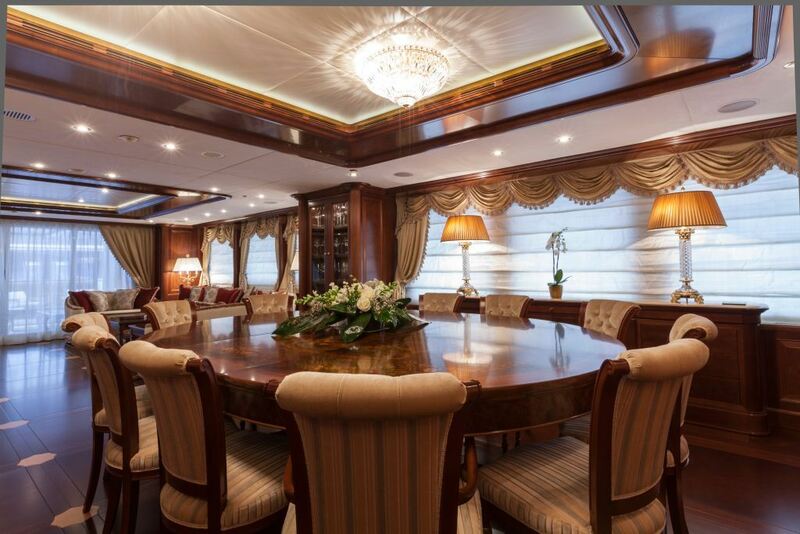 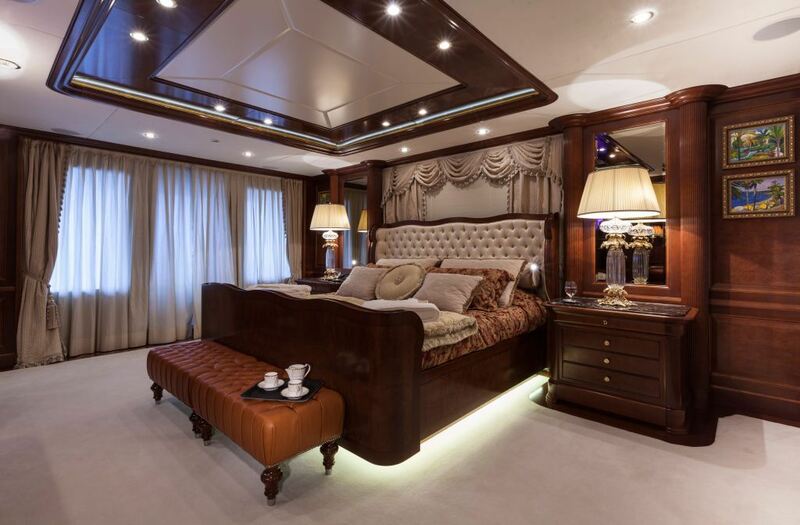 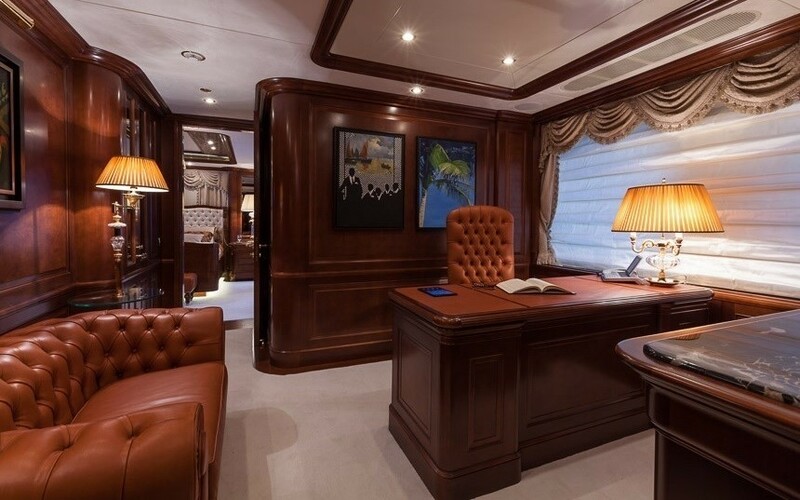 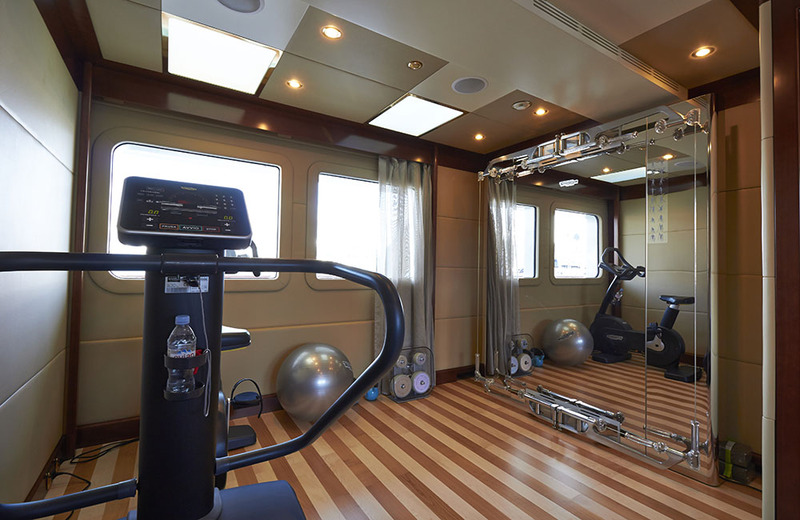 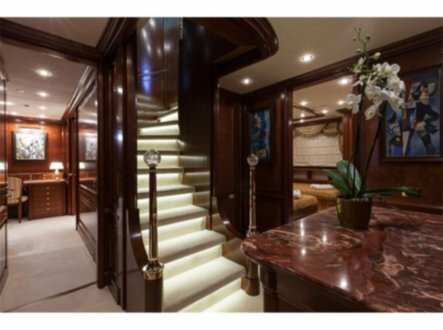 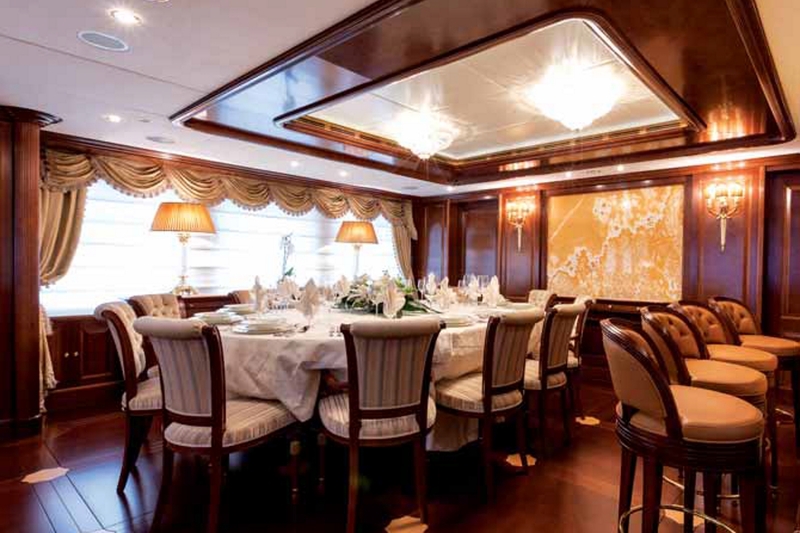 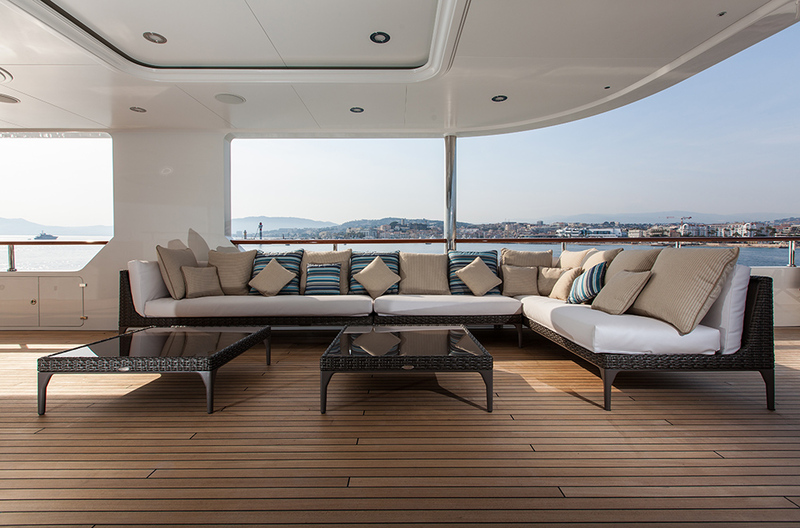 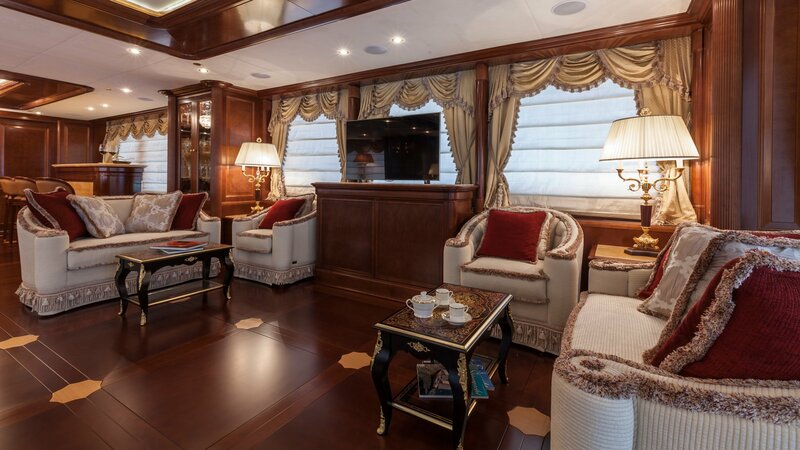 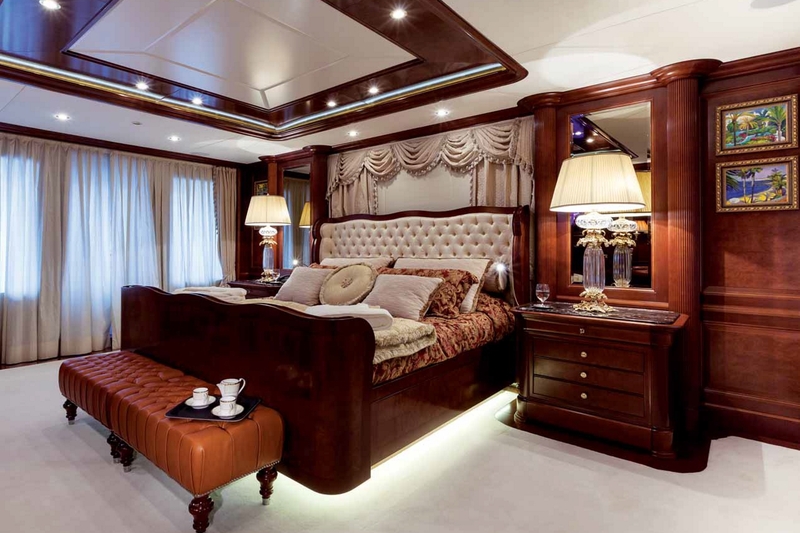 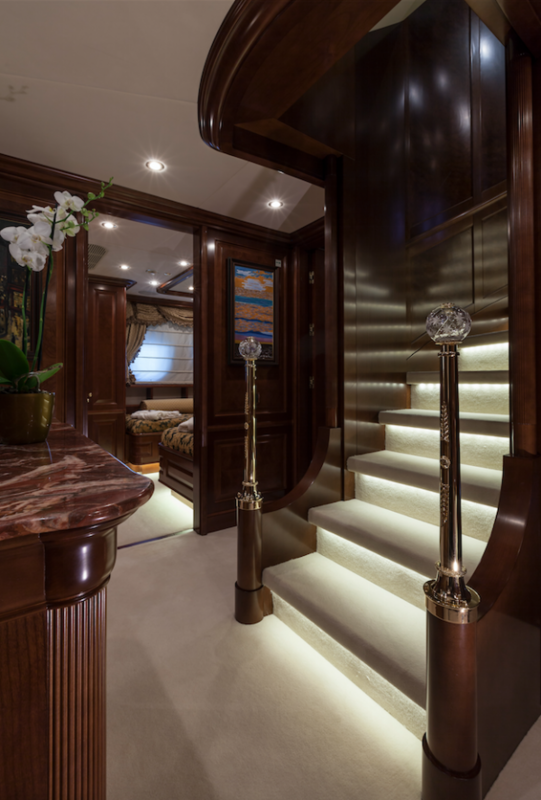 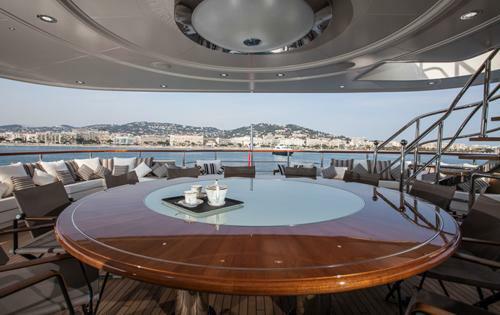 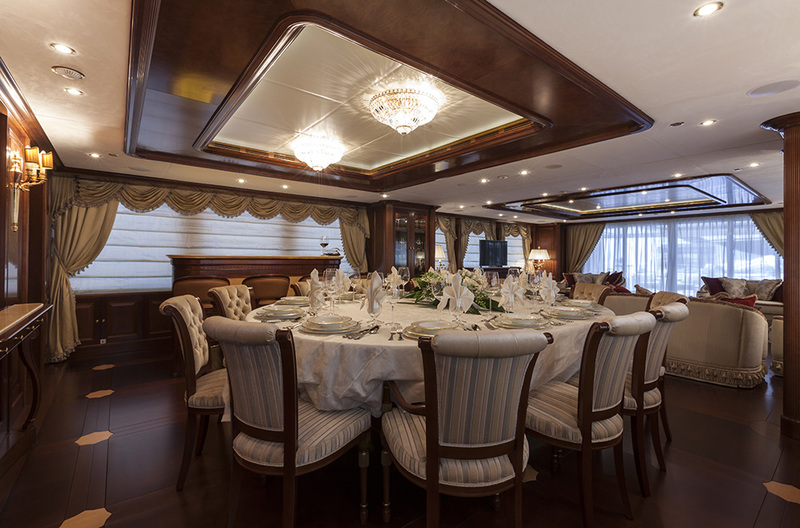 Motor yacht PRIDE’s tri deck design offers a large salon and dining space on the main deck in an open plan. 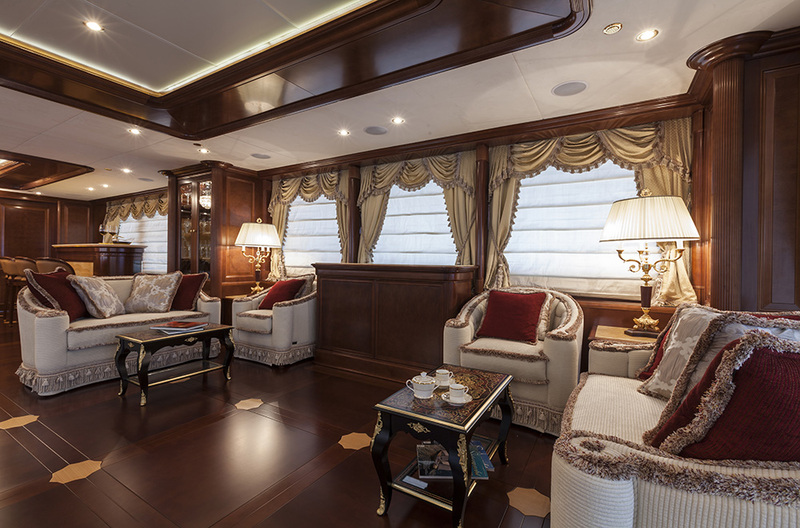 The décor is classical traditional with a refined feel of sophistication. 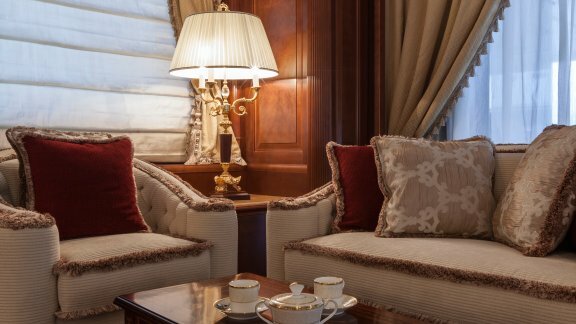 Fine deluxe soft furnishings, hand polished wood panels, intricate detailed wood floors and luxurious window treatments create and exquisitely harmonious atmosphere. 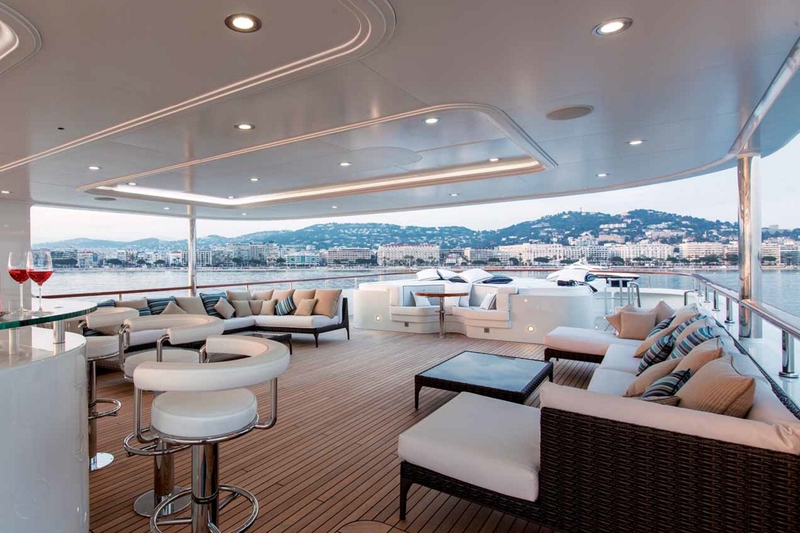 A sky lounge on the upper deck continues the stylish theme and boasts a large L shaped sofa, coffee tables and a large marble topped wet bar, ideal for evening entertaining. 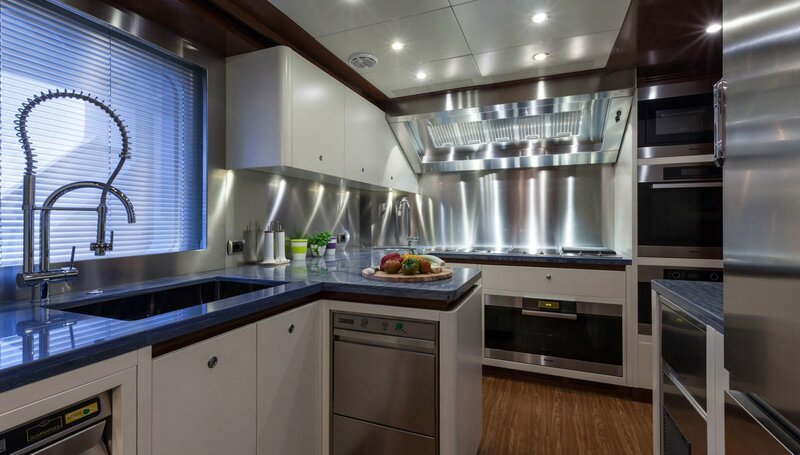 Exterior living is capacious aboard the M/Y PRIDE. 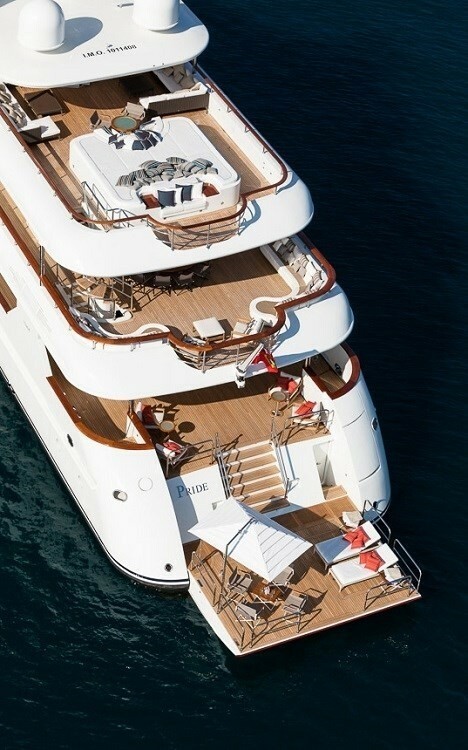 The main deck aft offers a comfortable shaded outdoor lounge, followed by a center lined staircase to the extended teak beach and sauna. 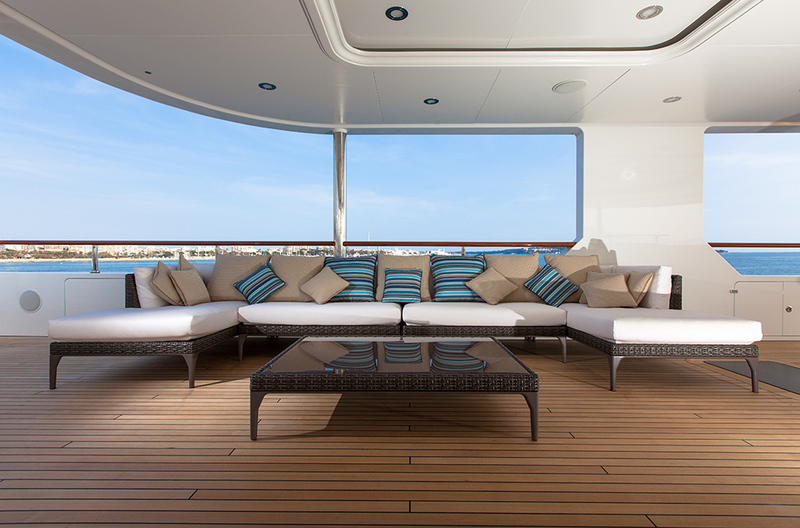 Above on the upper deck, guests may dine alfresco after a cocktail in the skylounge, or simply relax in one of the exterior lounge chairs. 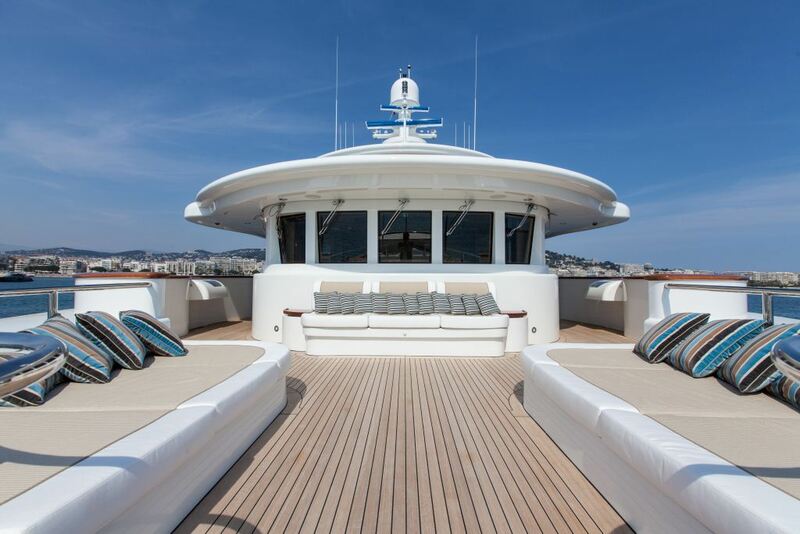 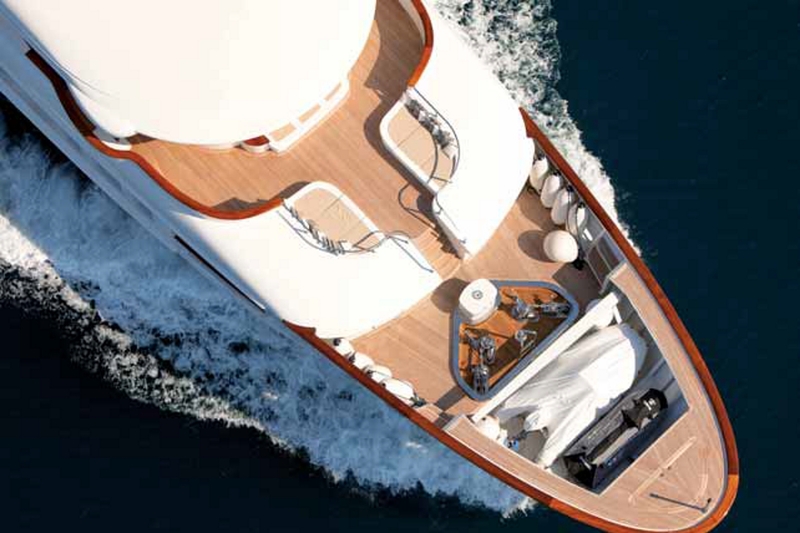 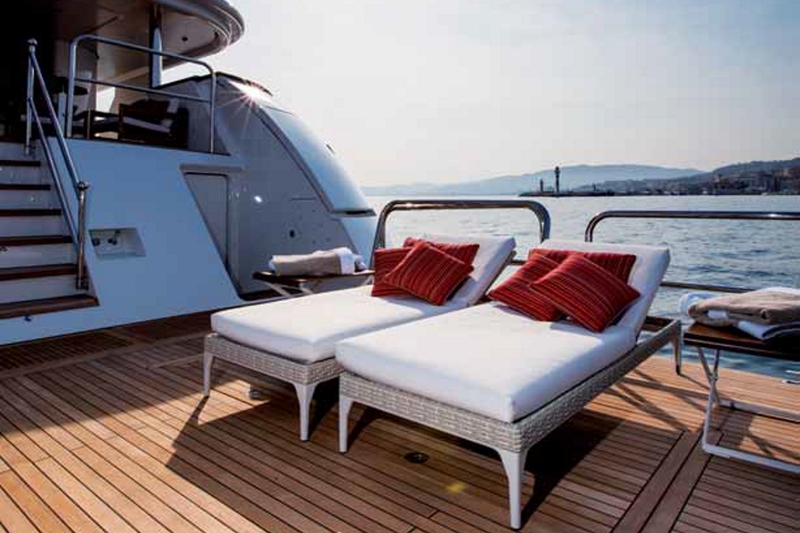 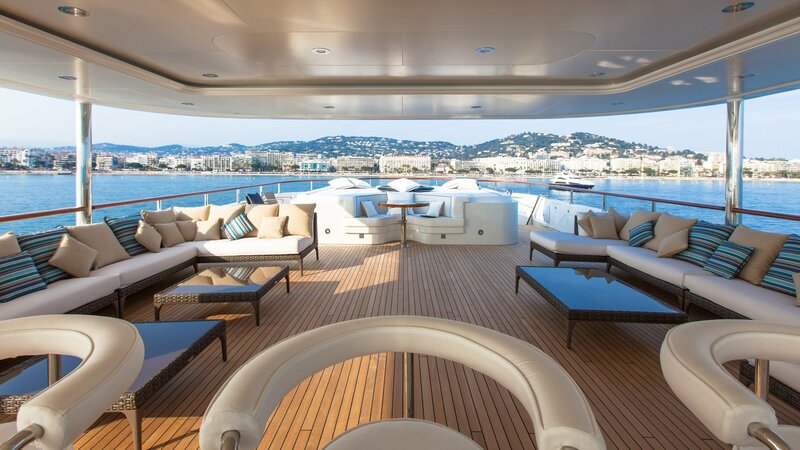 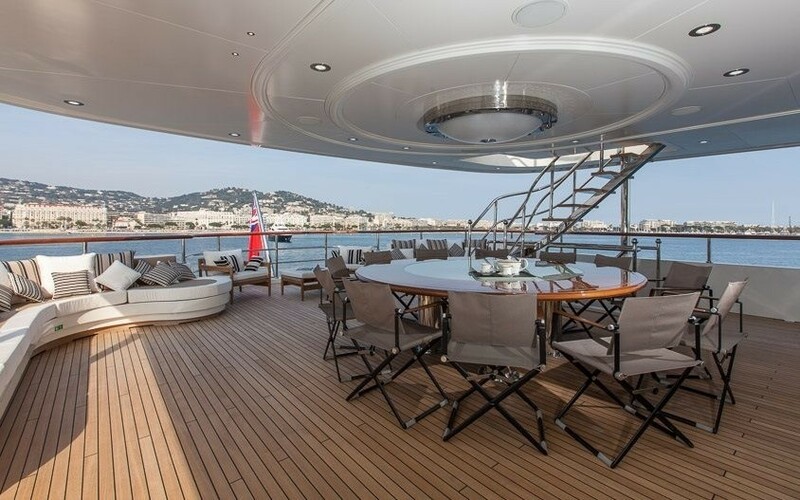 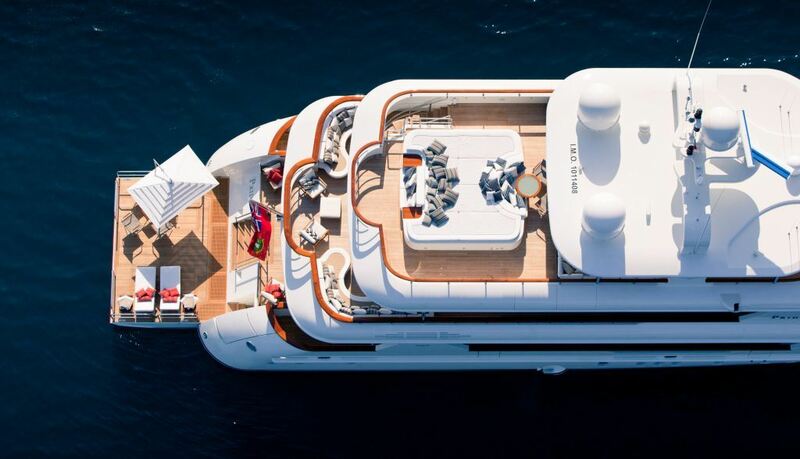 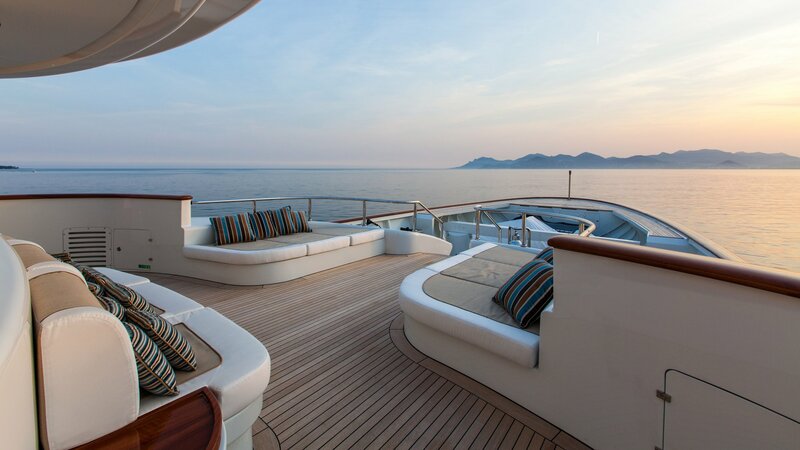 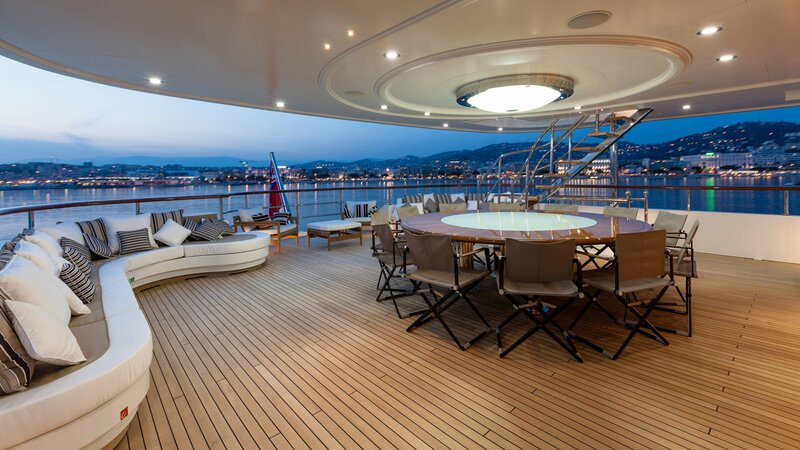 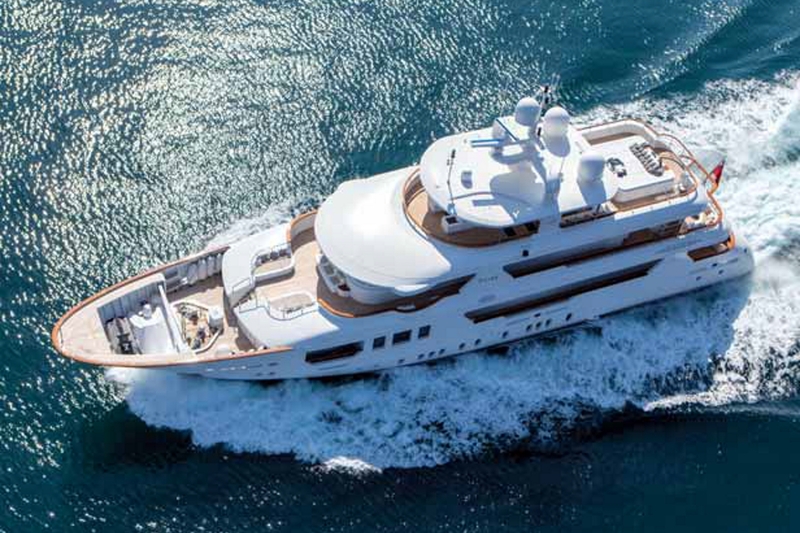 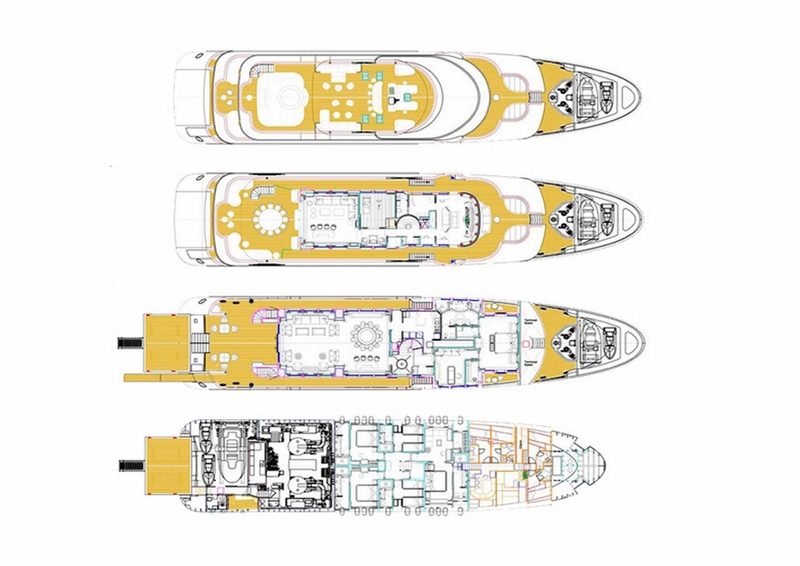 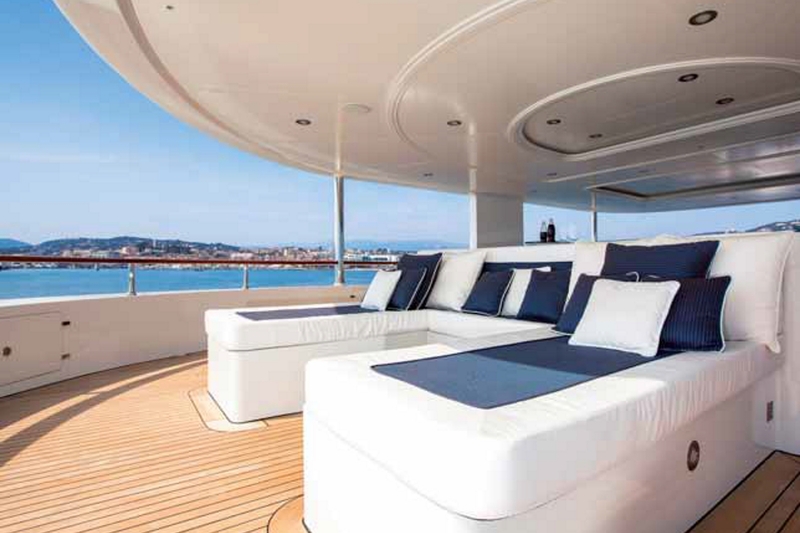 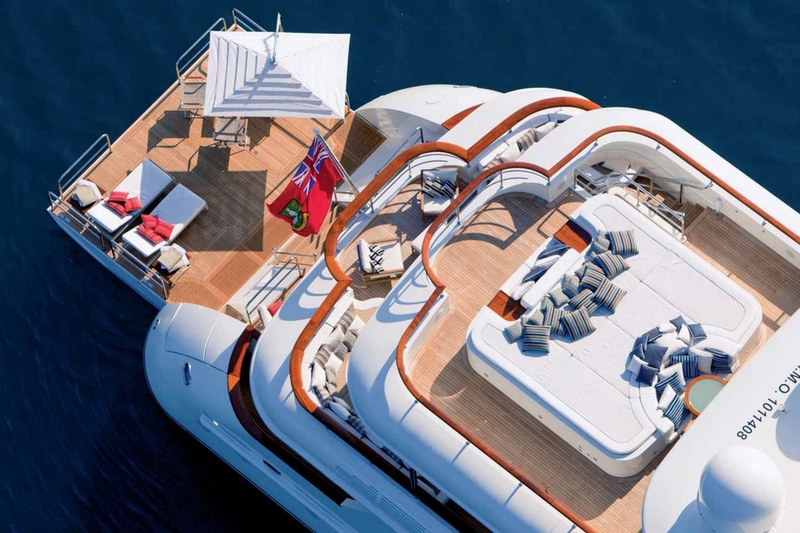 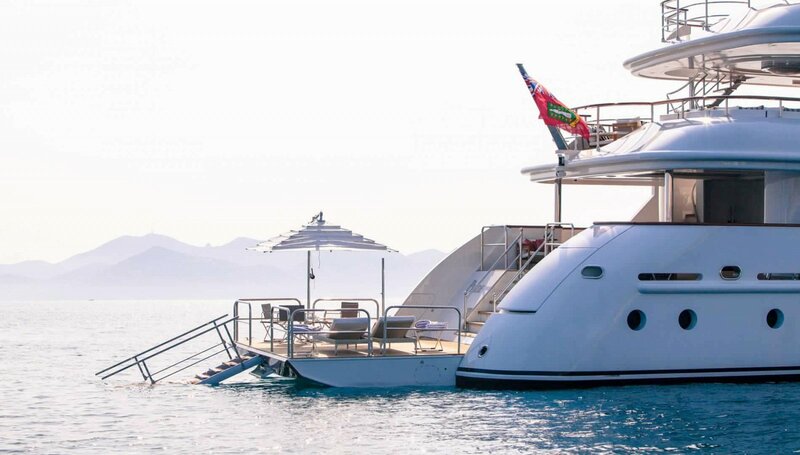 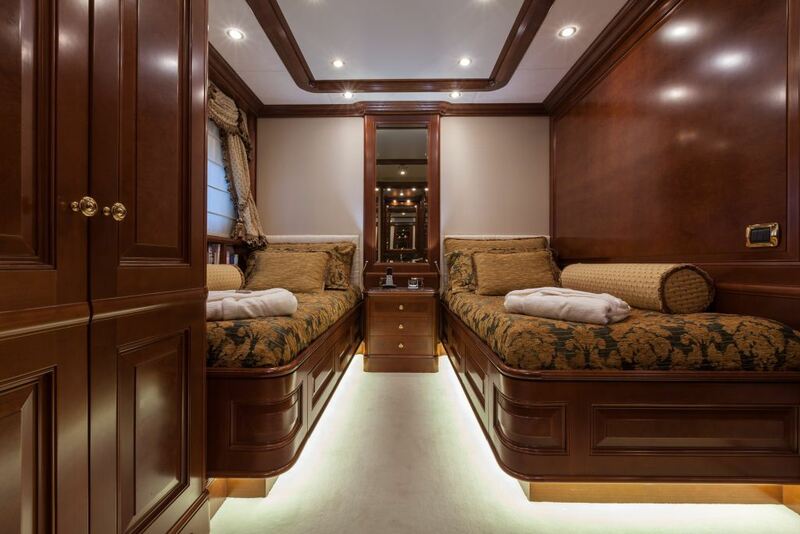 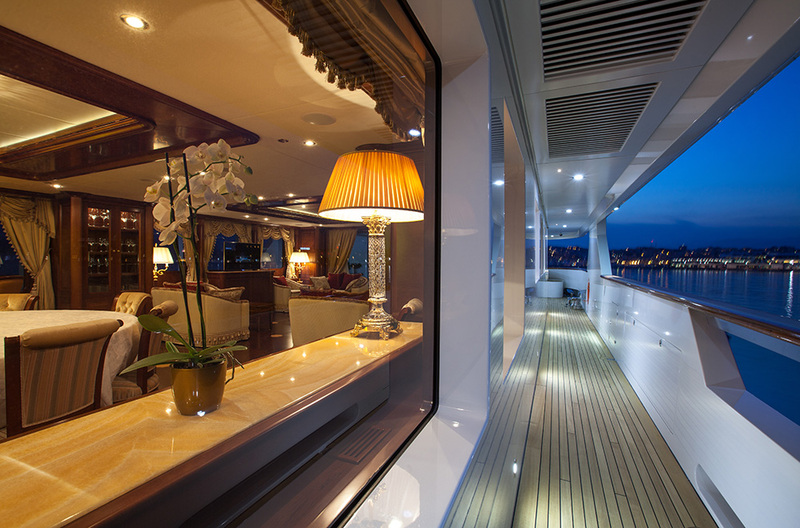 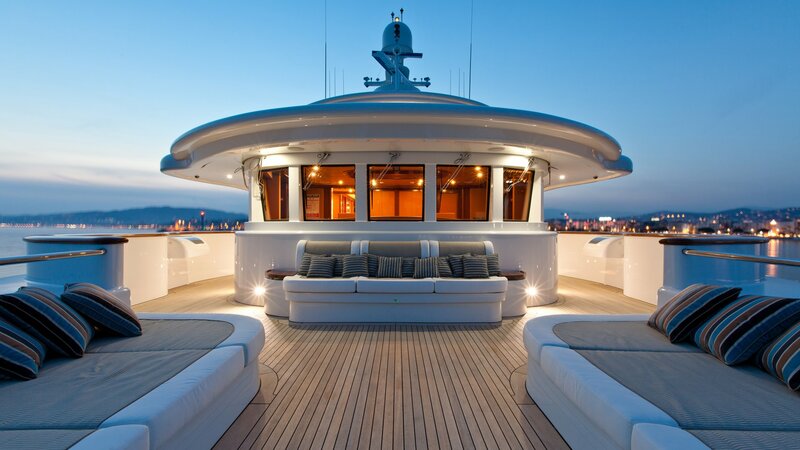 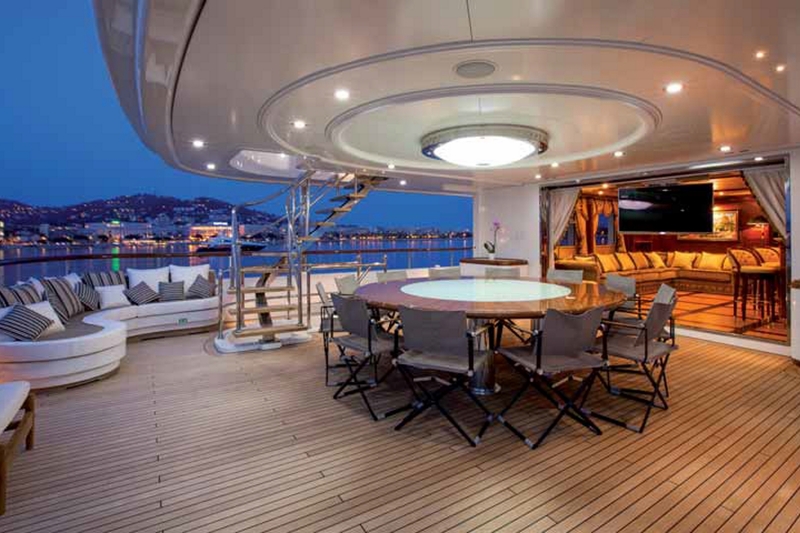 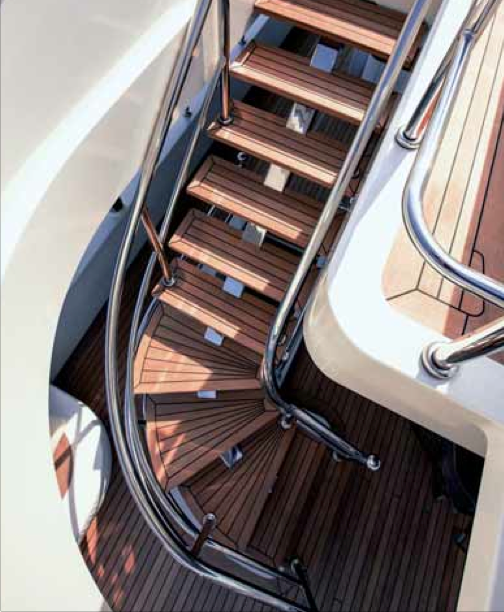 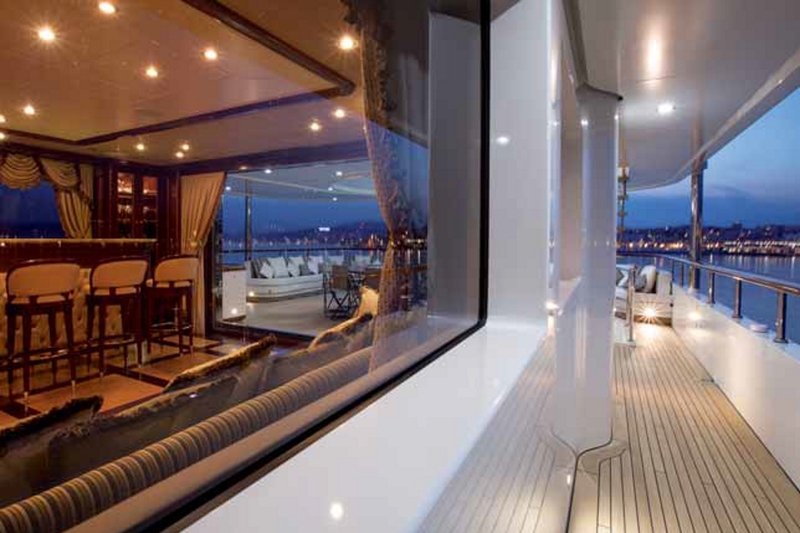 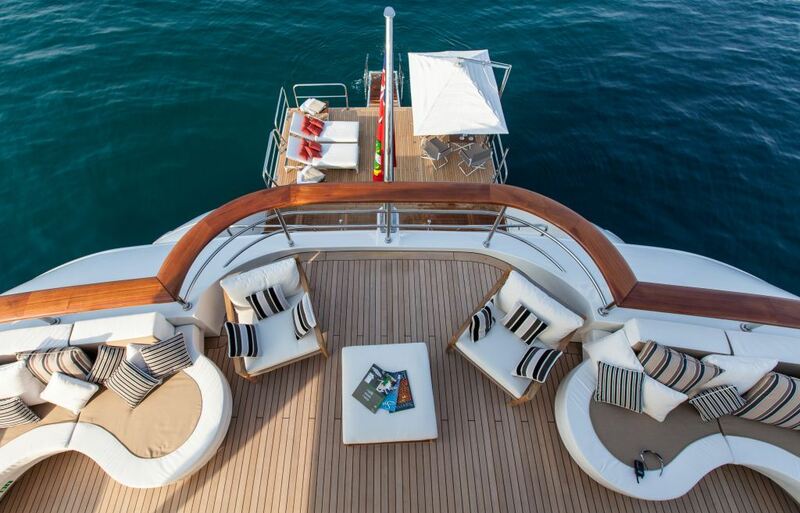 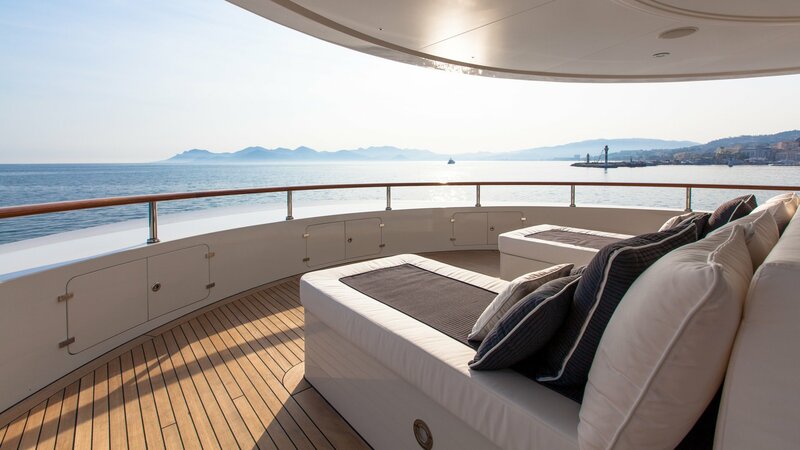 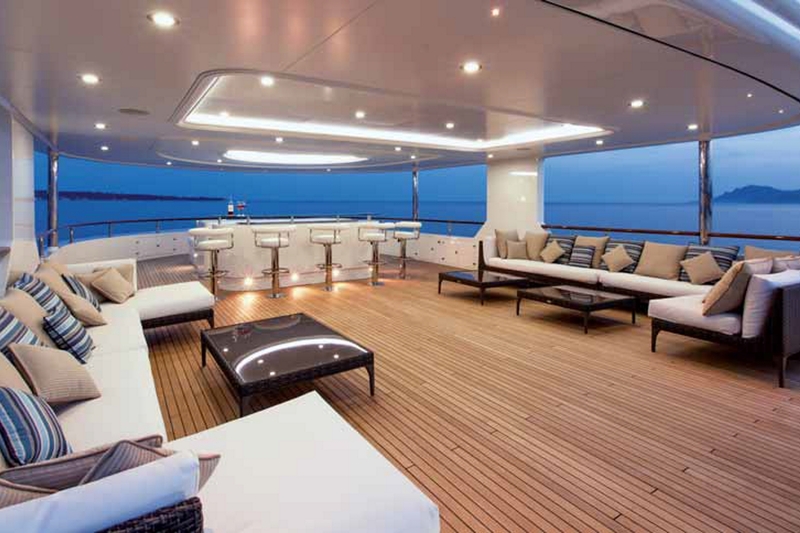 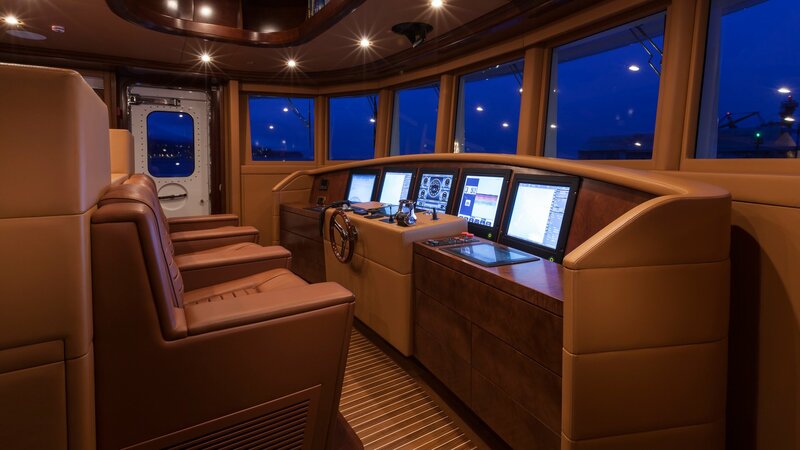 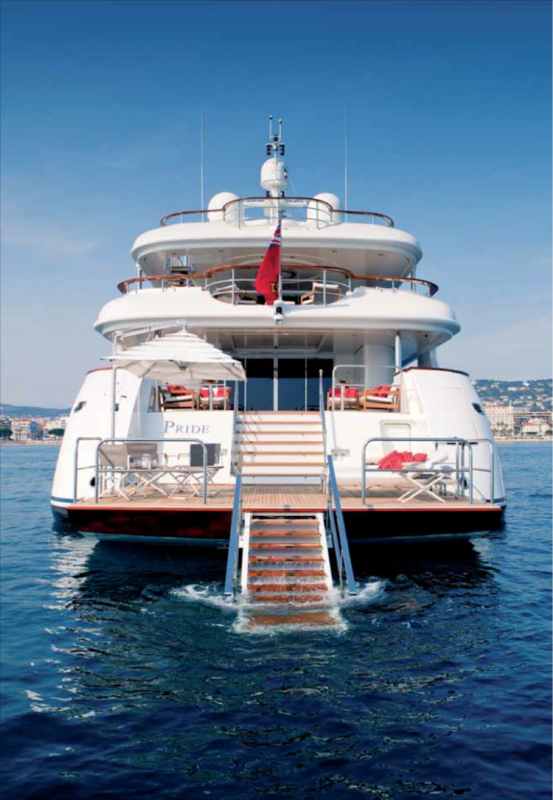 The upper deck wraps around the yacht 360° leading to 2 massive sunpads on the foredeck. 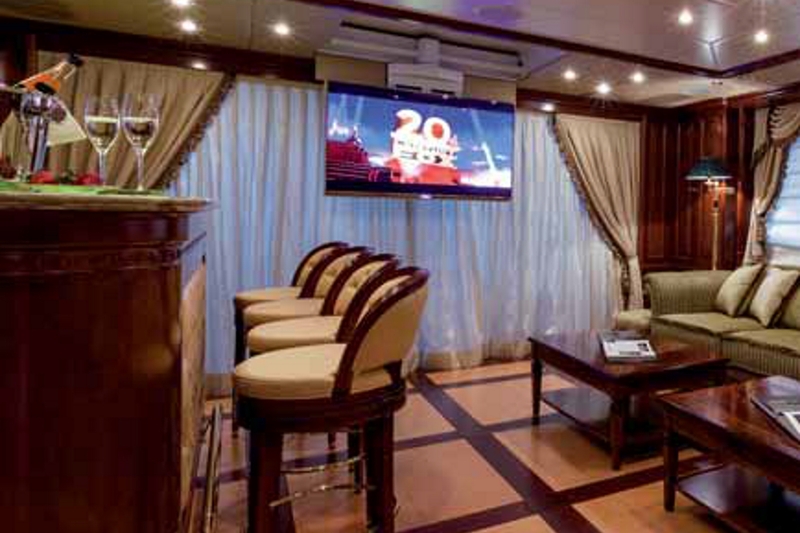 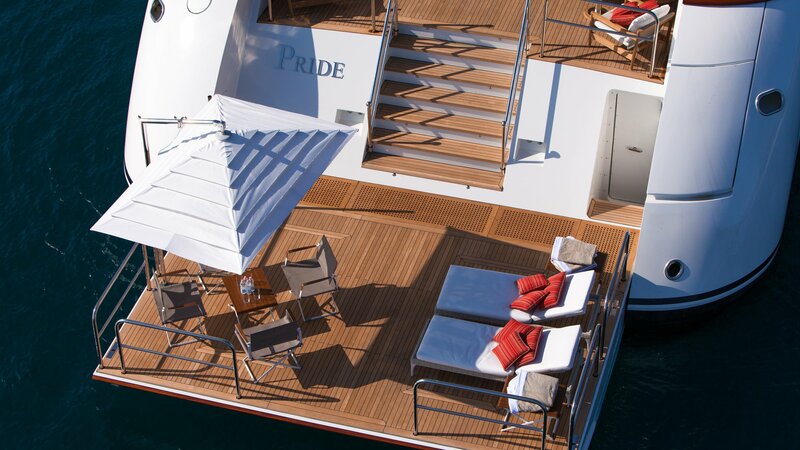 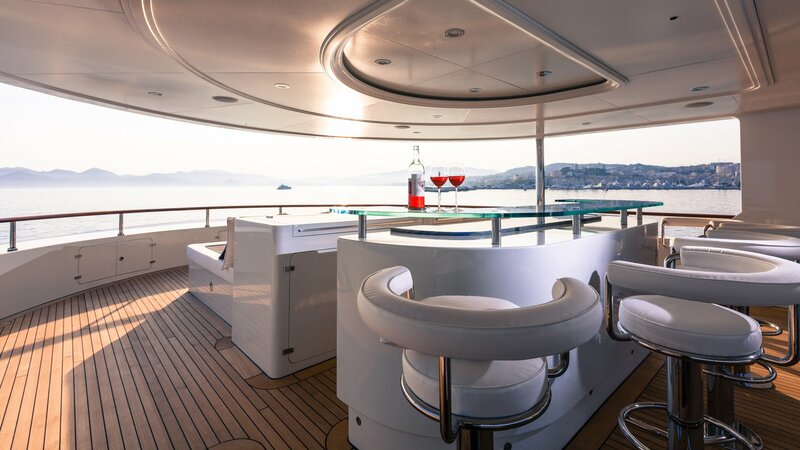 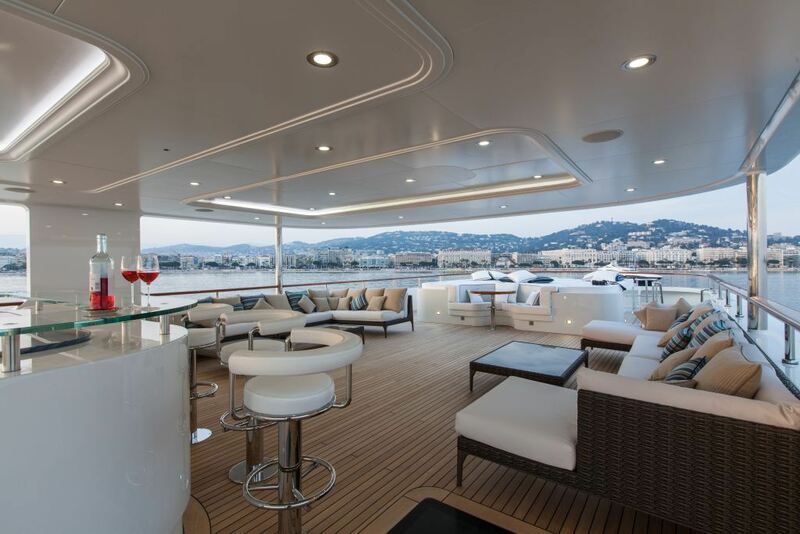 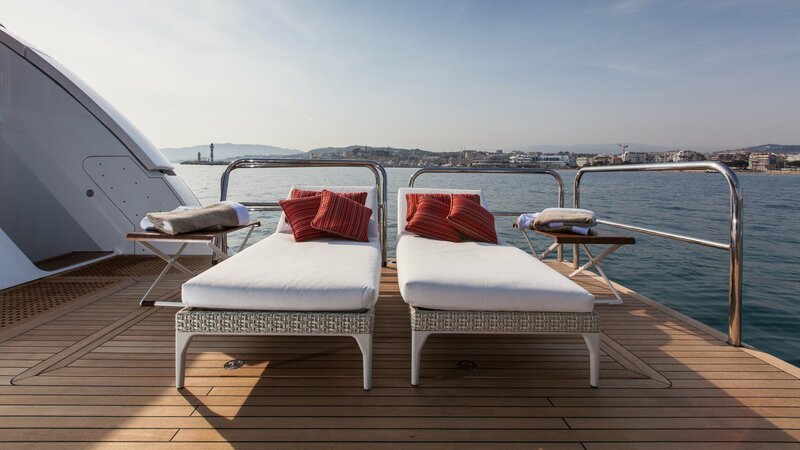 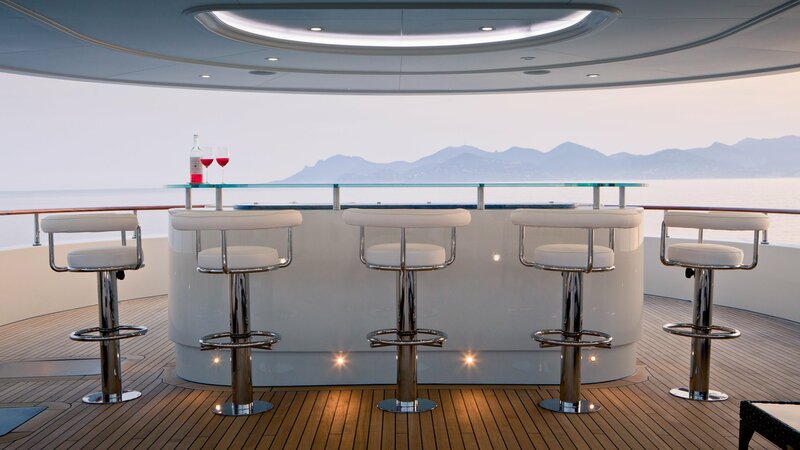 PRIDE boasts a fabulous sundeck, complete with a massive sunpad, ample seating and a luxurious glass topped wet bar. 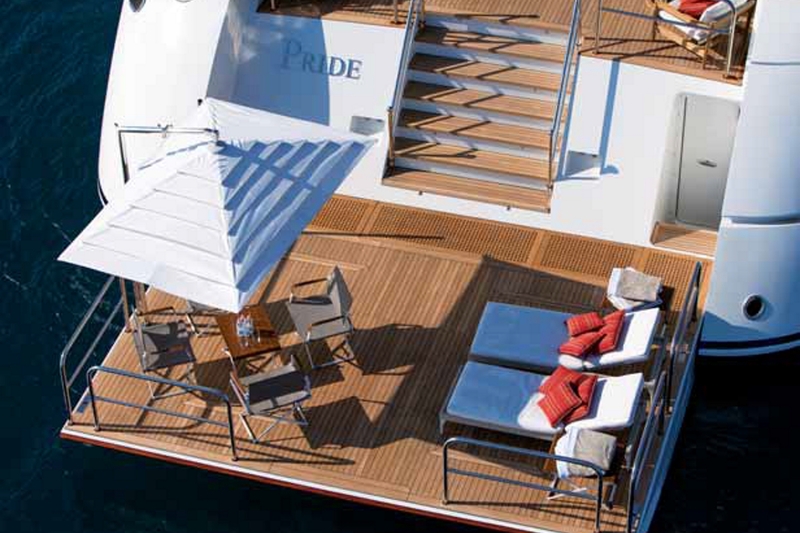 Made of steel and aluminum, the Viudes 45 yacht PRIDE is Lloyds registered and MCA compliant. 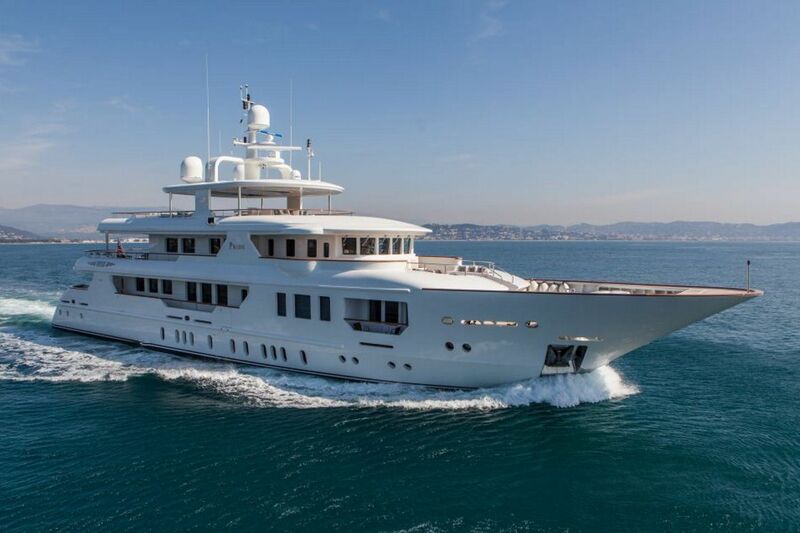 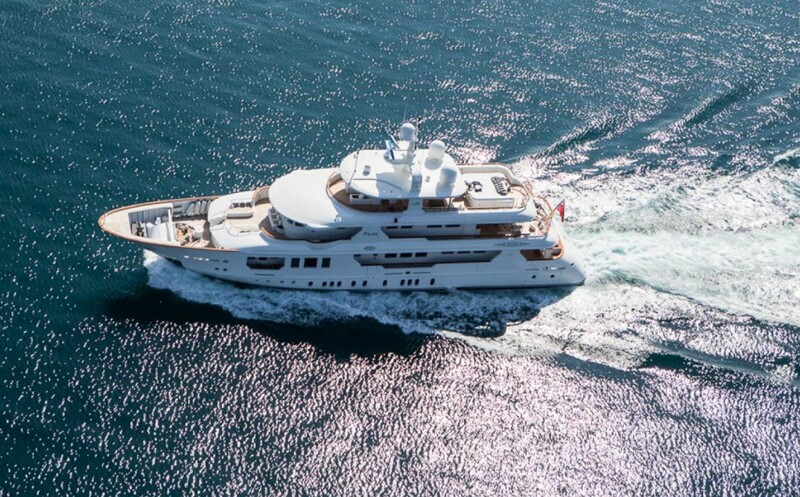 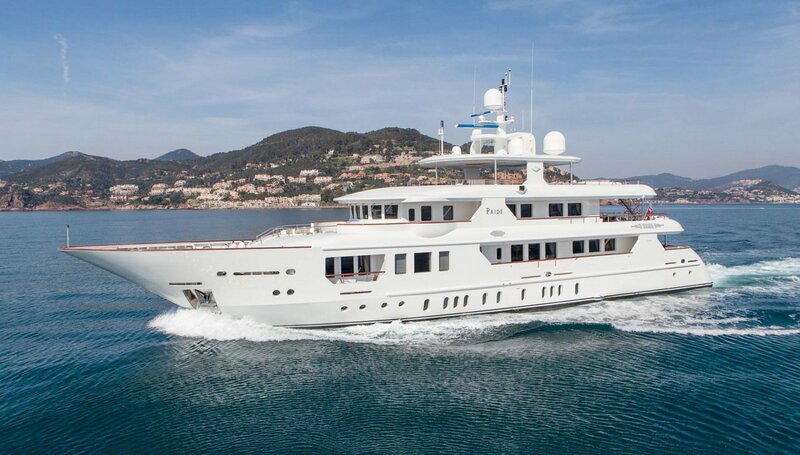 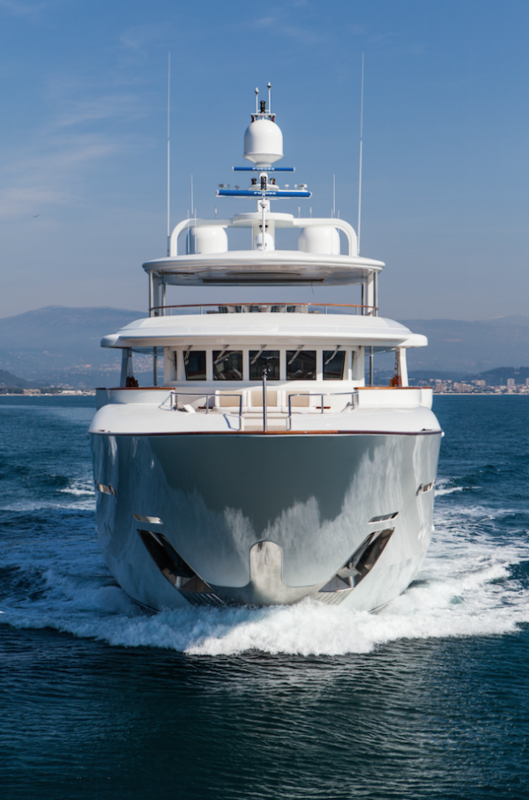 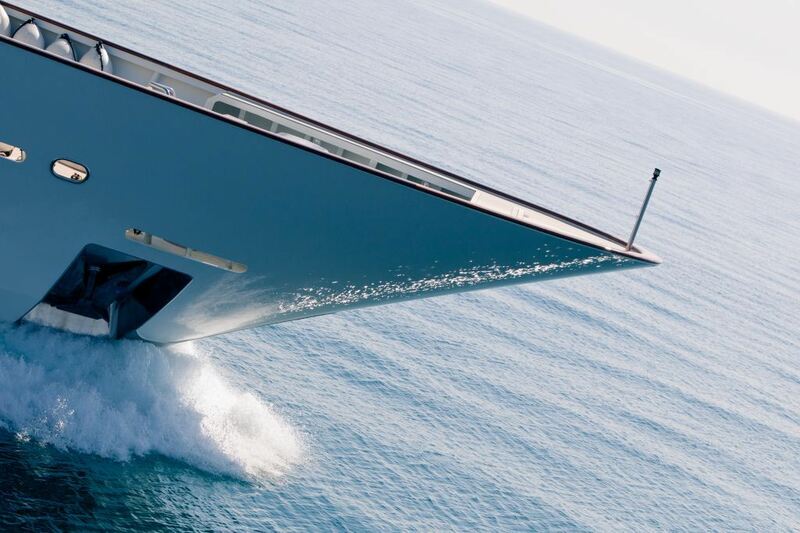 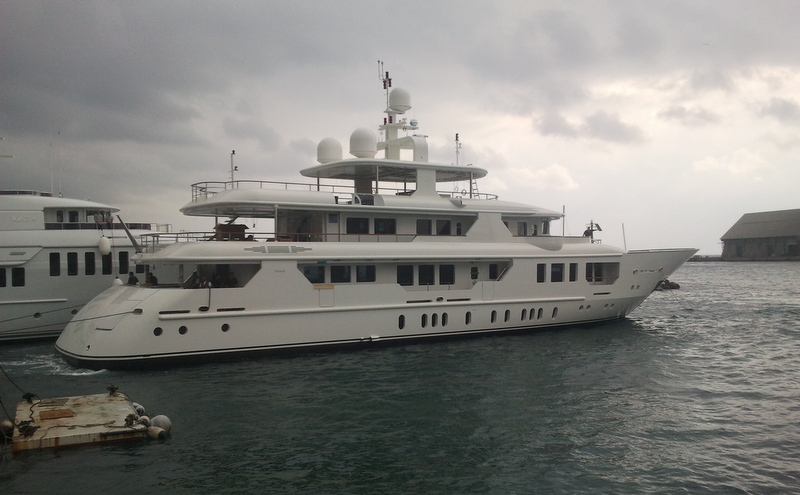 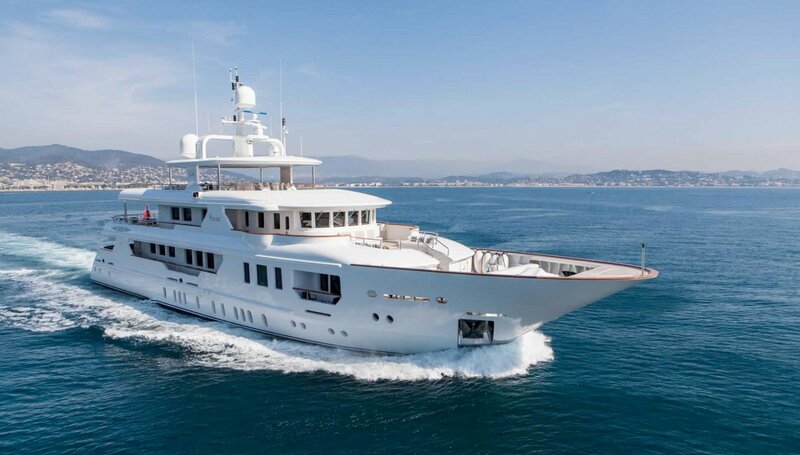 She is run by twin Caterpillar C32 diesels, delivering her a top speed of 14 knots and a cruising speed of 12.5 knots. 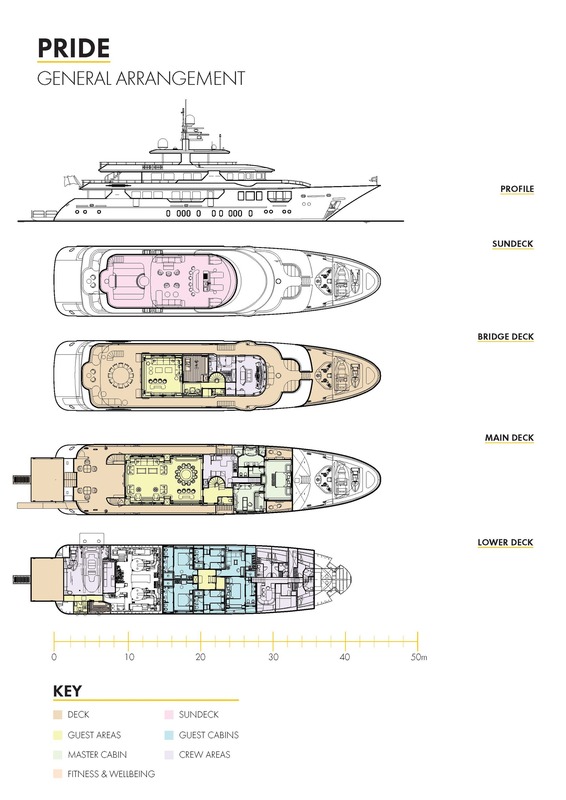 Her beam is of 9,50m (31'17'') and her maximum draught is of 2,60m (8'53''). 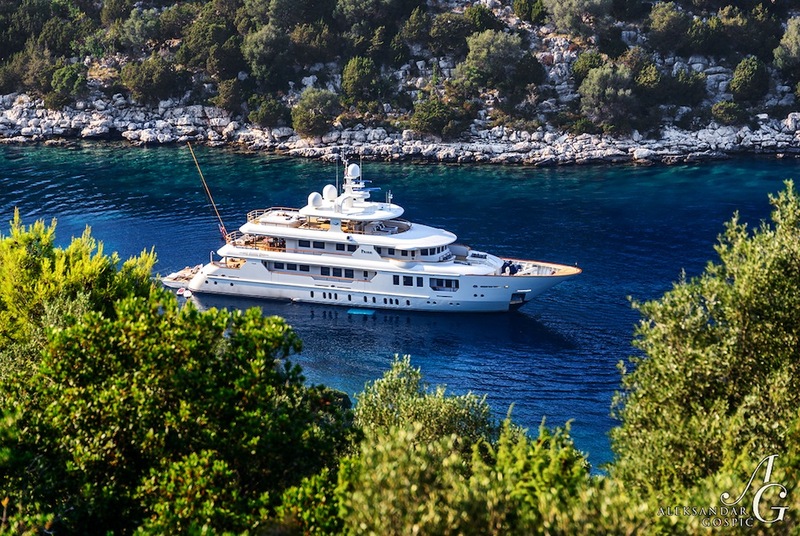 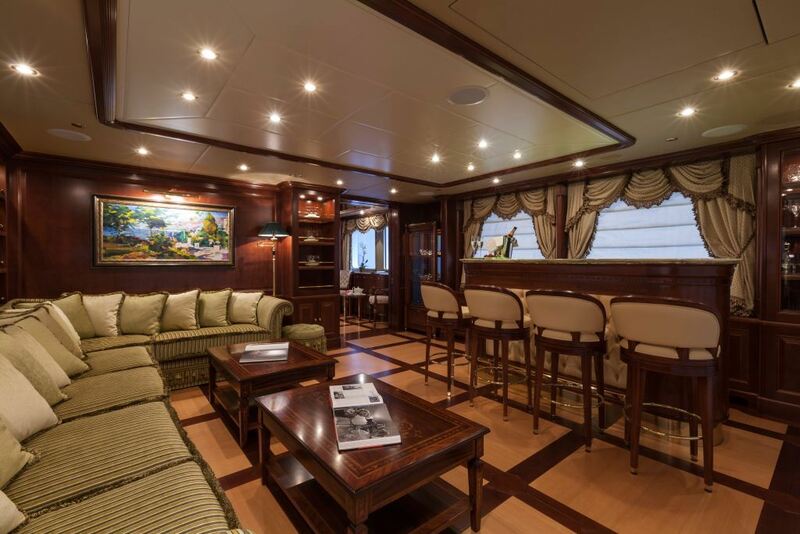 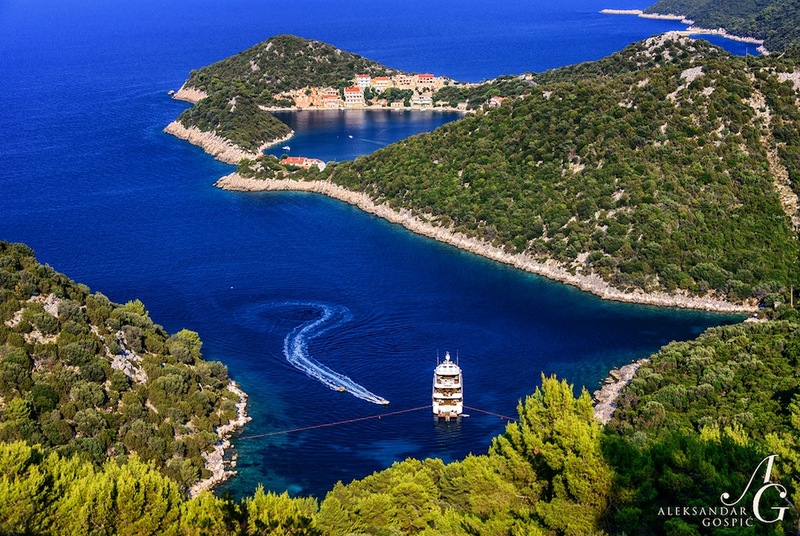 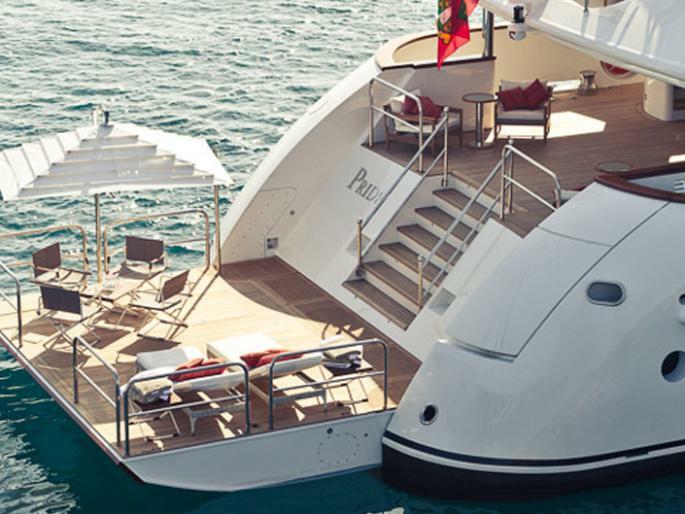 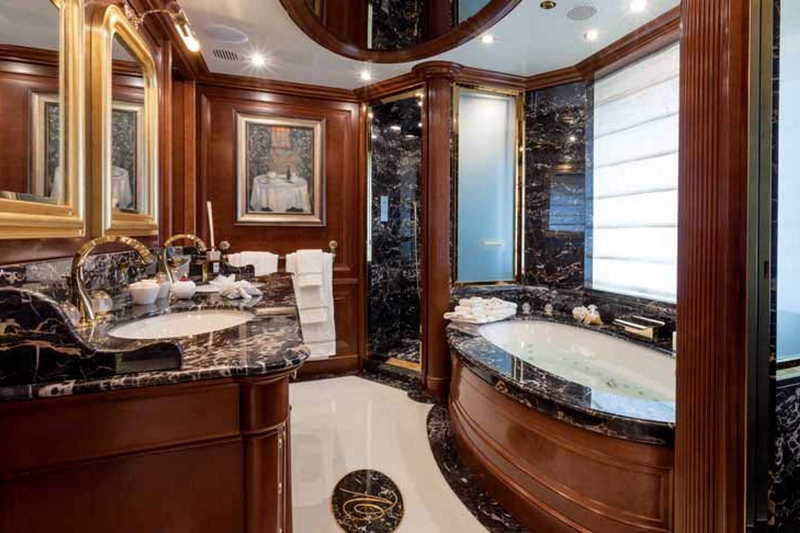 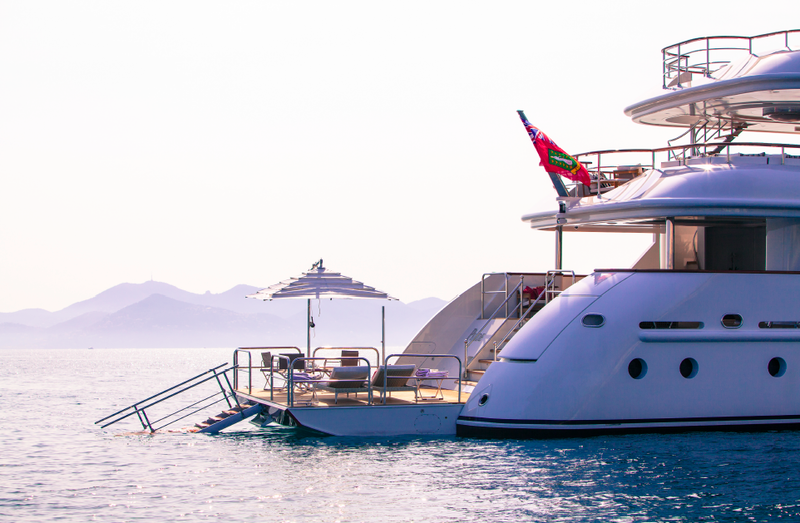 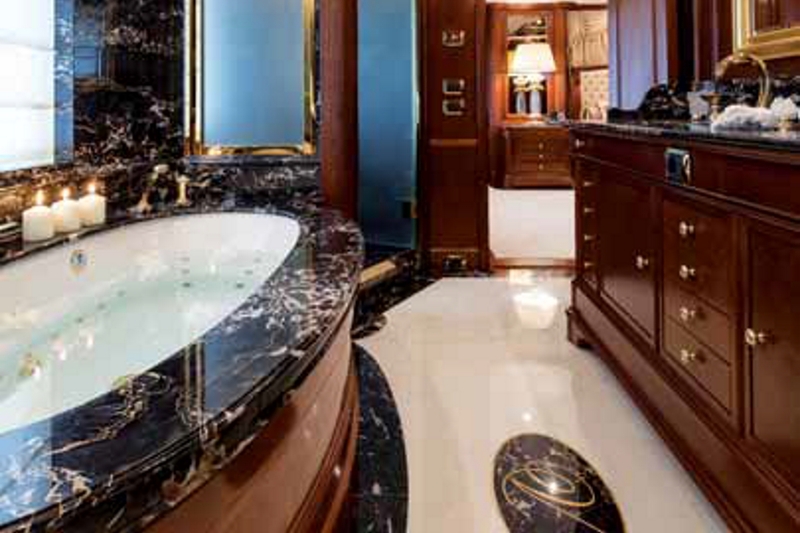 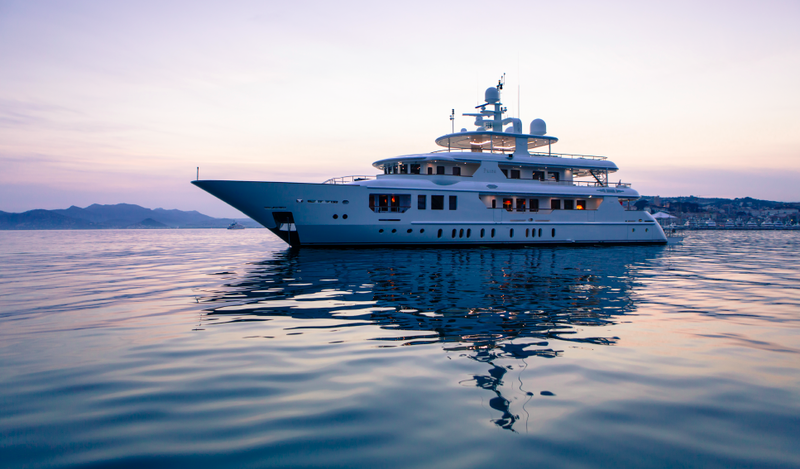 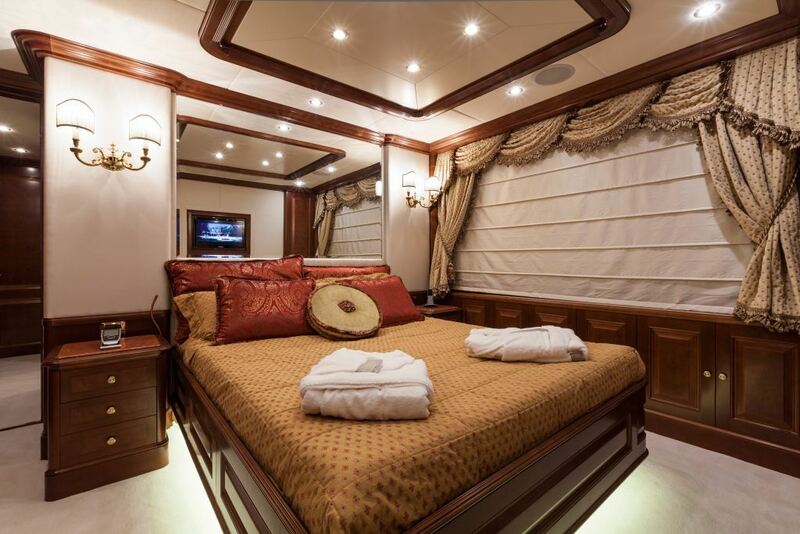 A total number of 12 charter guests can find utmost luxury aboard PRIDE, in 6 beautifully appointed cabins. 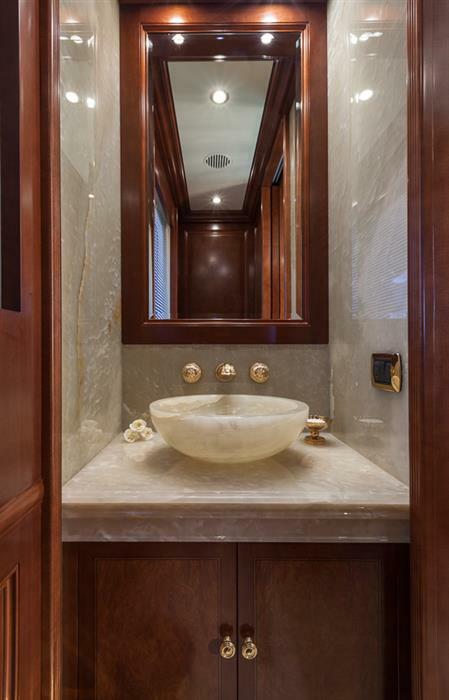 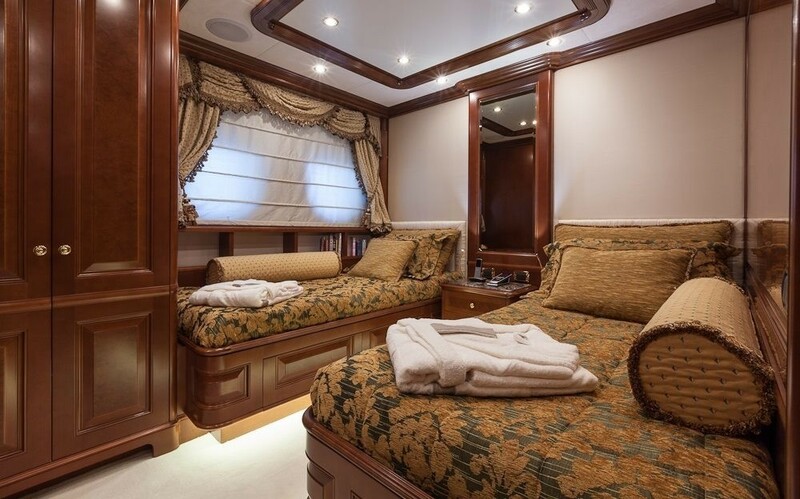 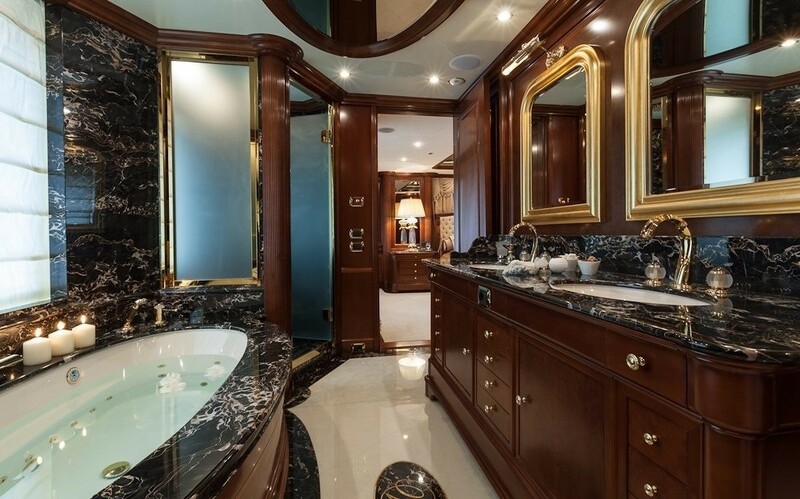 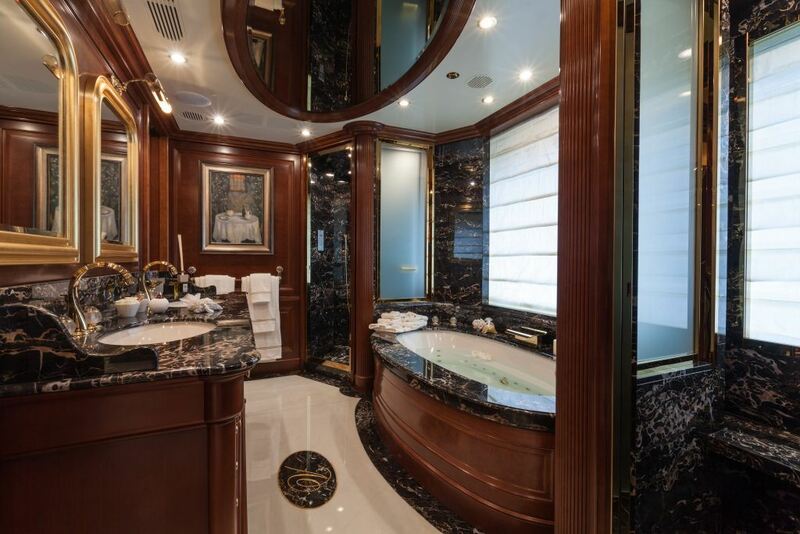 These include a full-beam master suite on the main deck with a king size bed, two side balconies, a private lounge area with an office and beautifully finished marble topped en-suite facilities with a shower, tub and his and hers sinks. 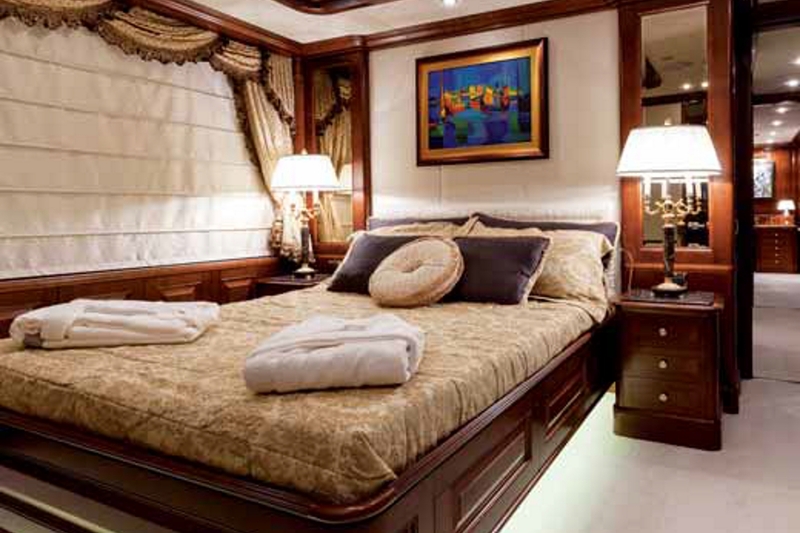 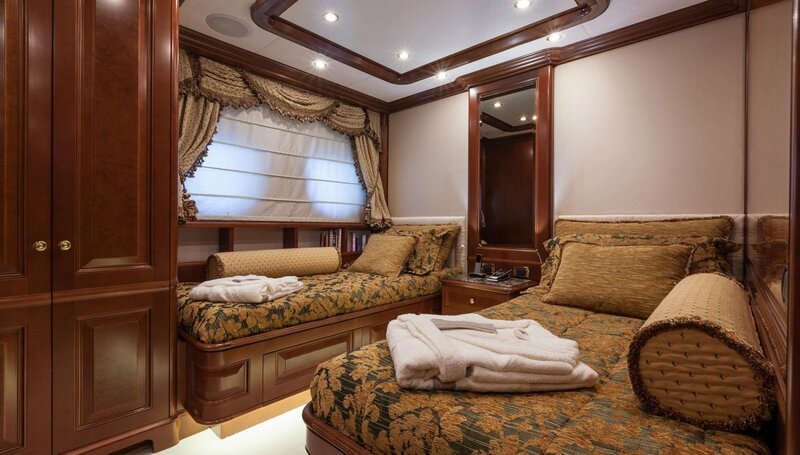 On the lower deck forward, the full-beam VIP cabin offers a king size bed, private lounge area and en-suite facilities. 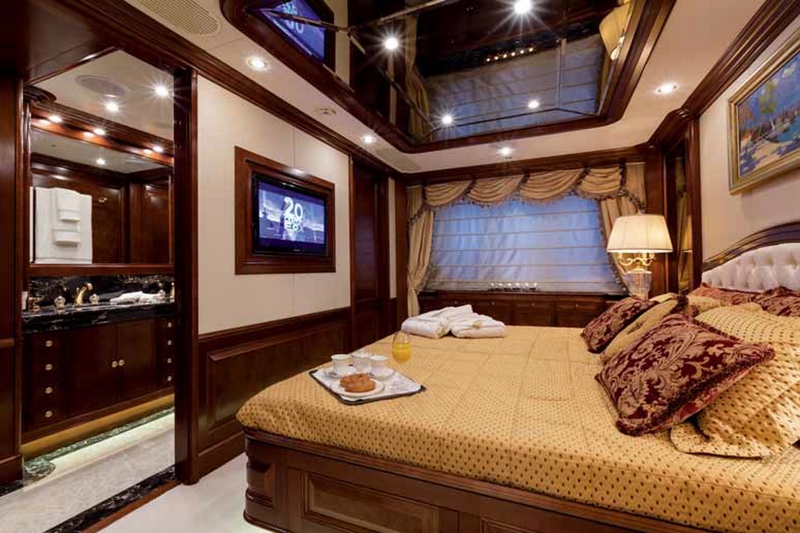 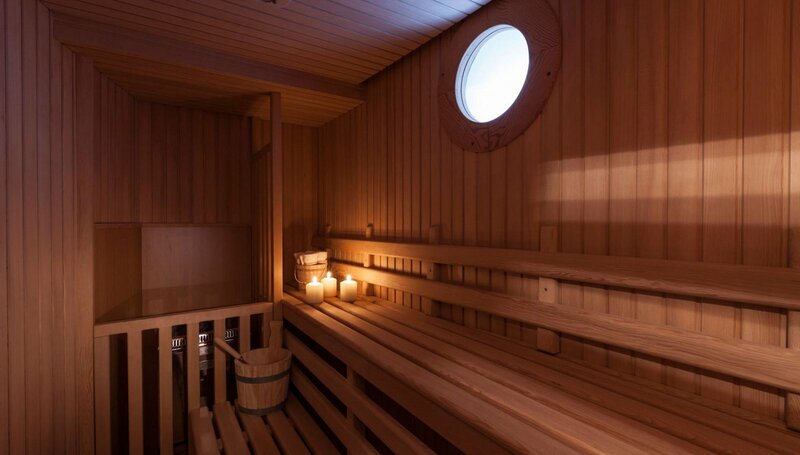 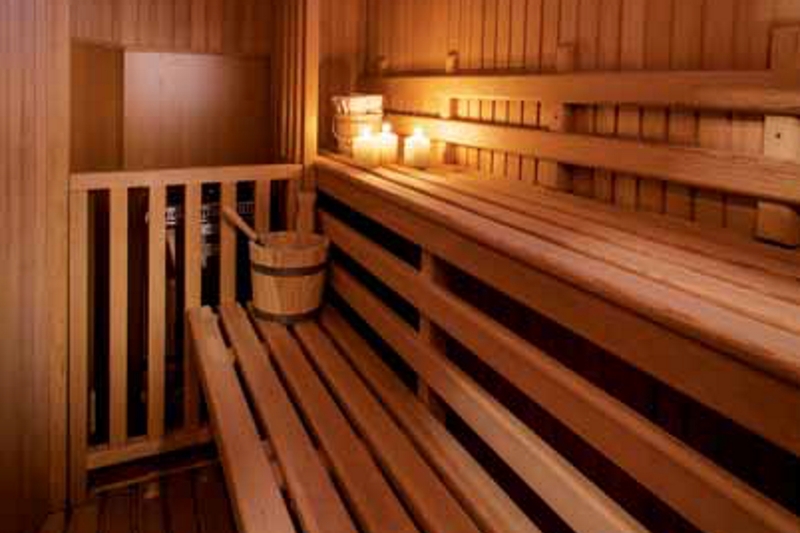 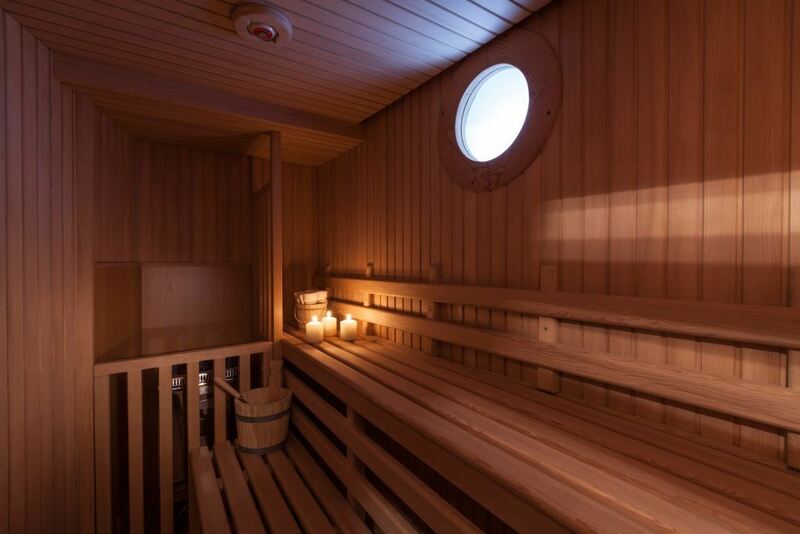 Two double cabins offer double beds and en-suite facilities and 2 twin cabins have 2 side by side single beds. 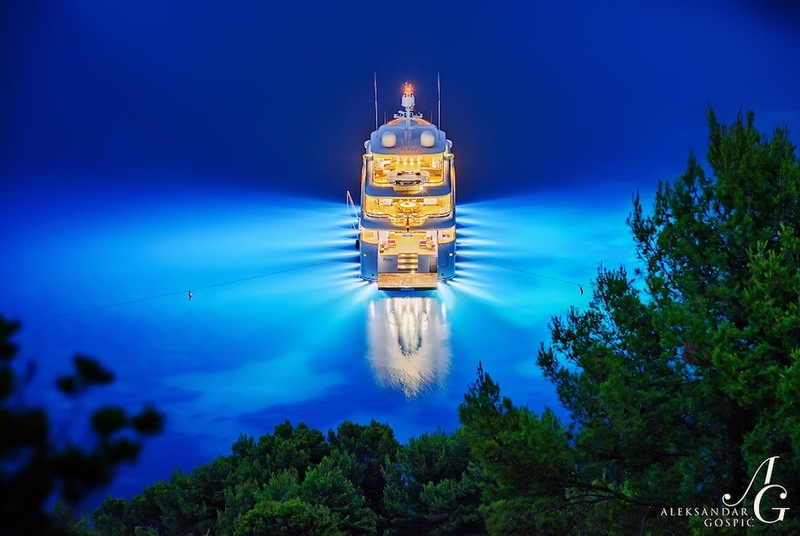 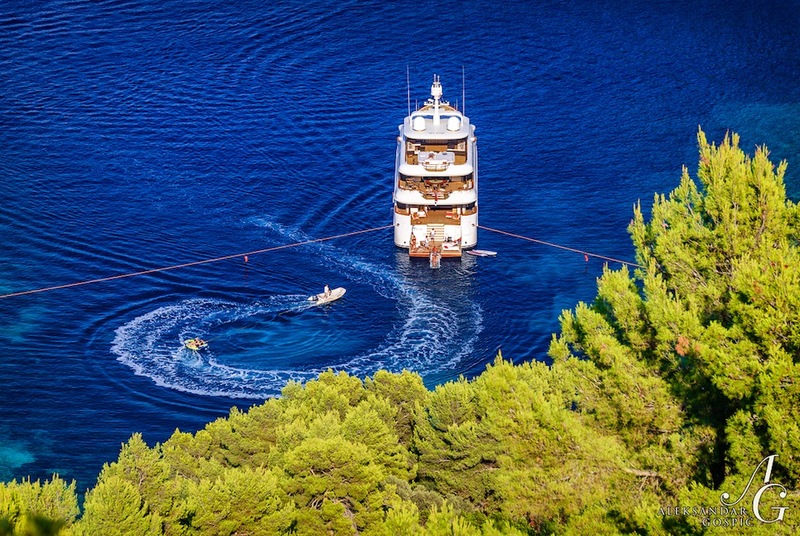 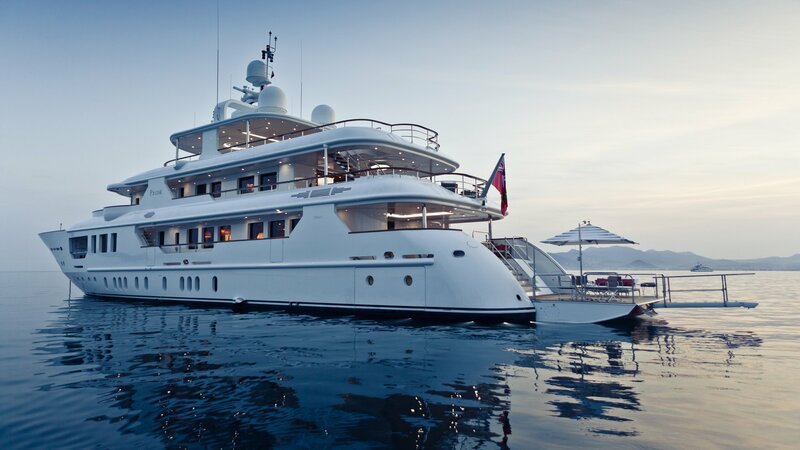 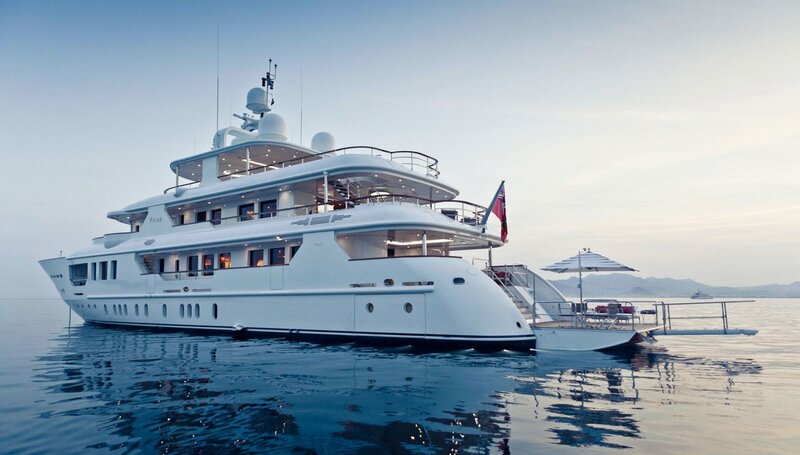 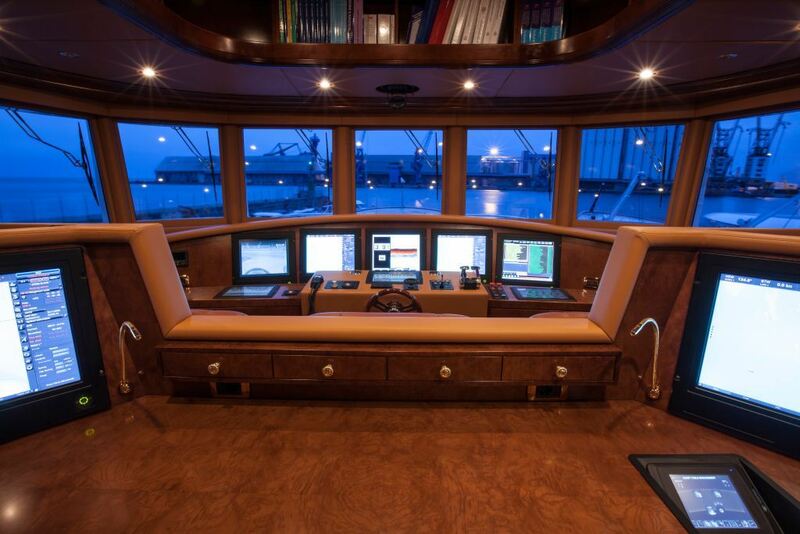 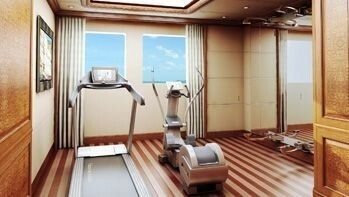 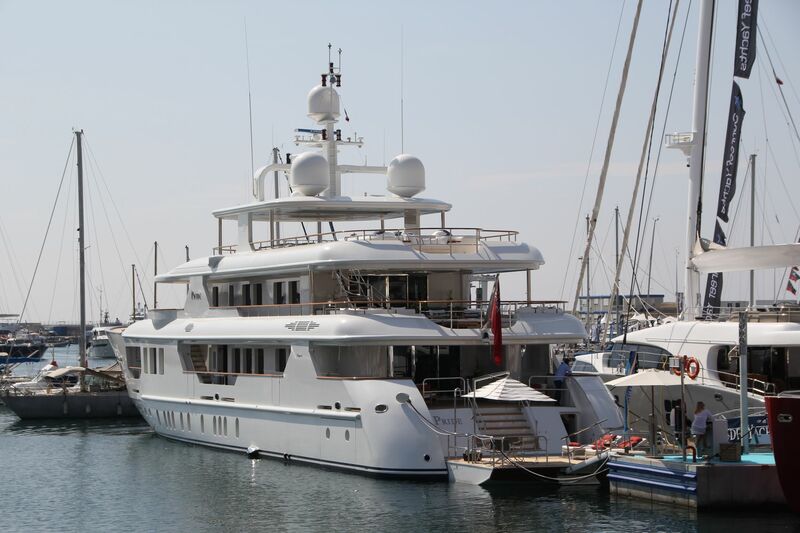 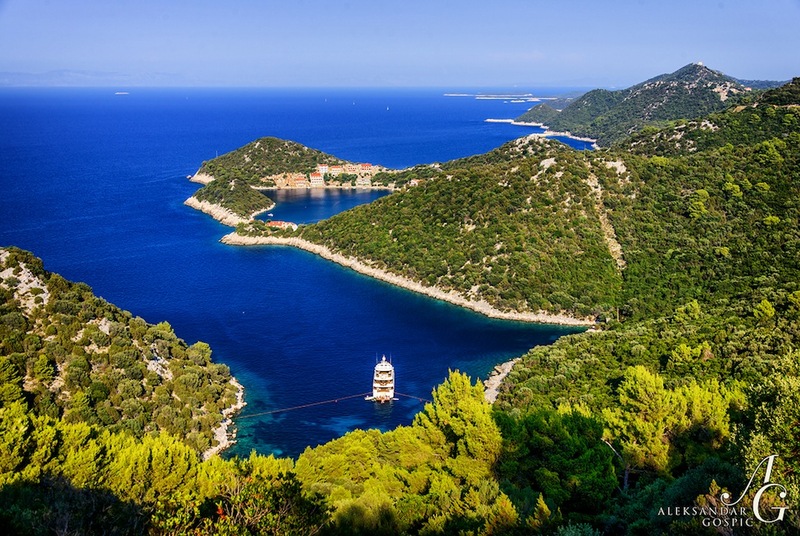 The vessel is managed by a highly trained crew of 9, sleeping in 5 crew cabins.